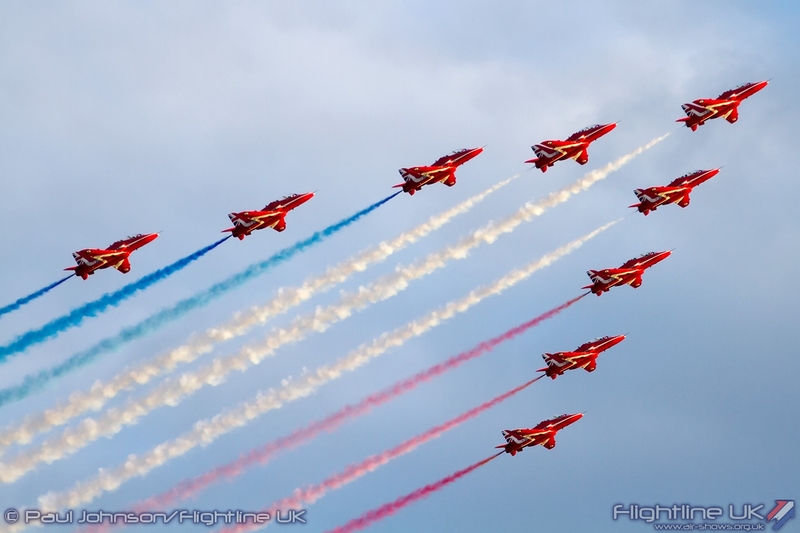 Aerospace and Defence are within the UK’s top 5 most important industries. 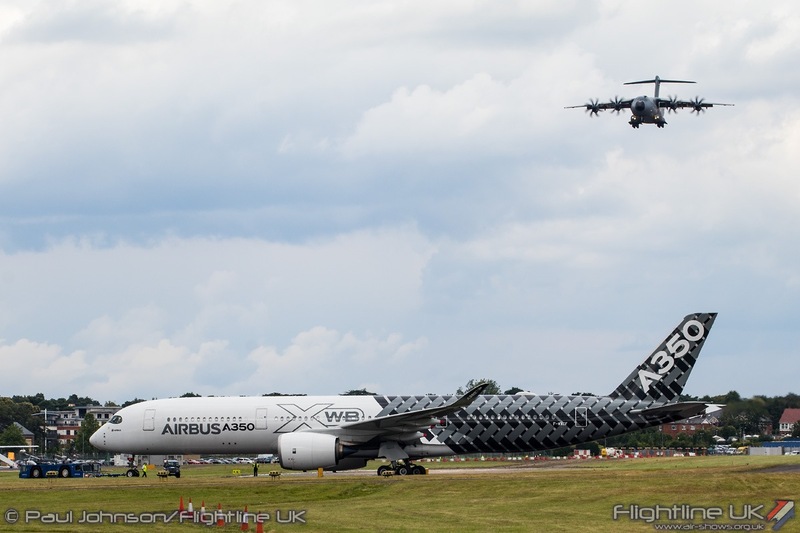 Every two years, Farnborough International Airshow provides the big shop-window event for that industry. 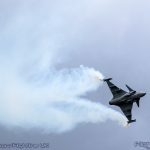 The Trade Days of the 2016 event took place in some very challenging conditions. 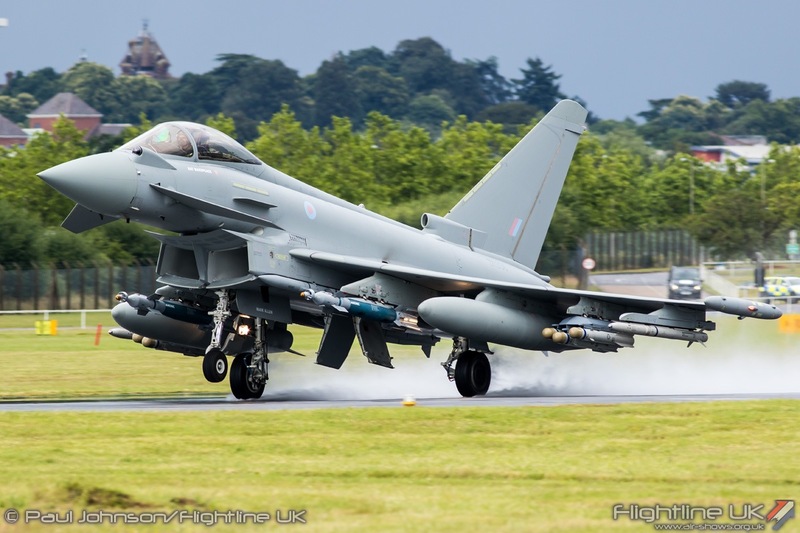 Both politically and economically, the fallout from the UK’s EU referendum has created some very volatile conditions. 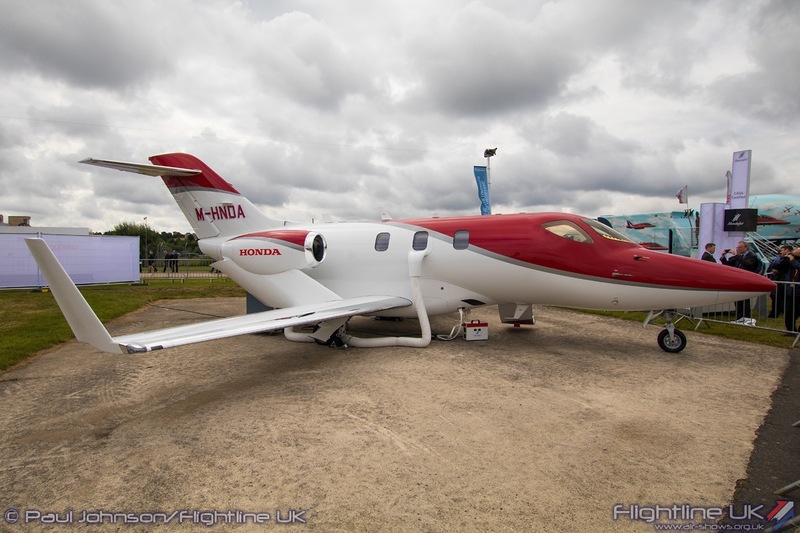 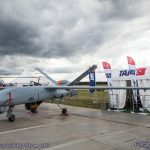 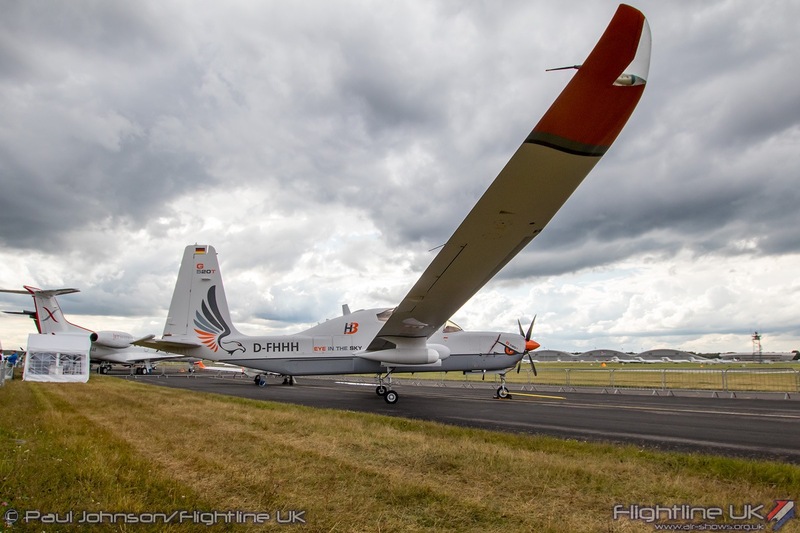 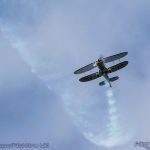 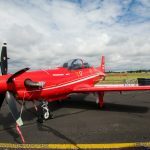 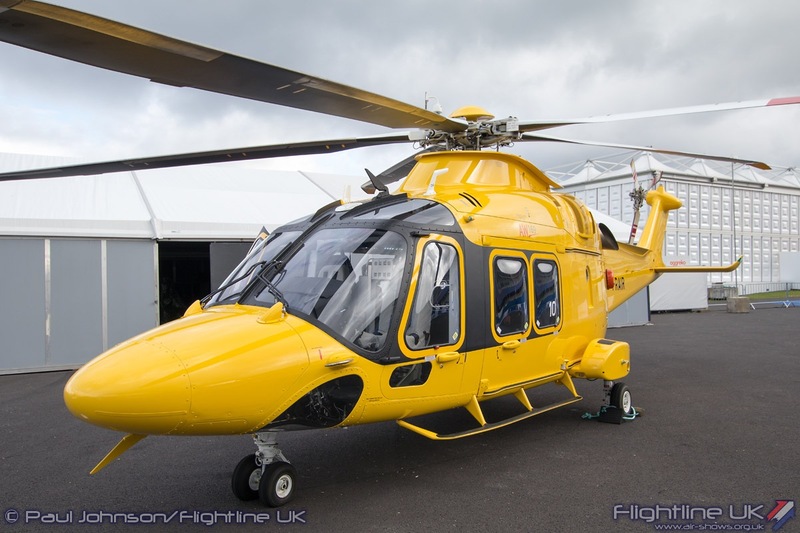 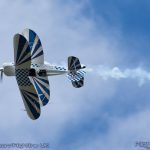 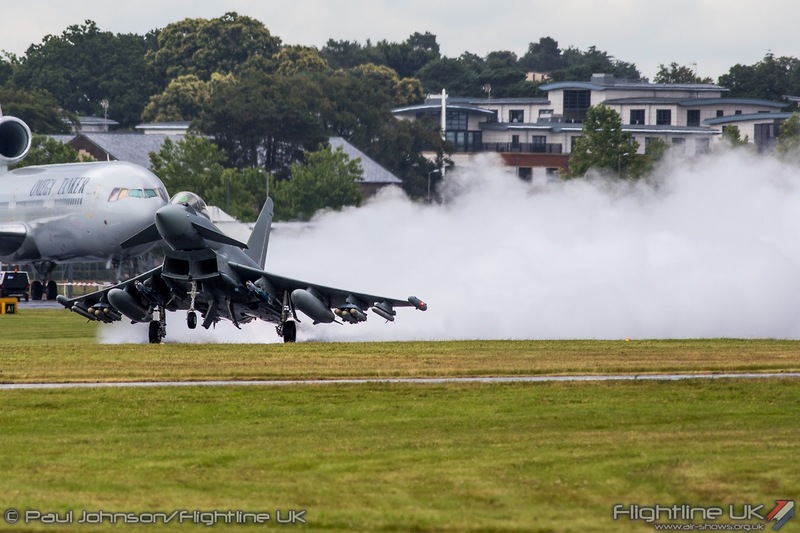 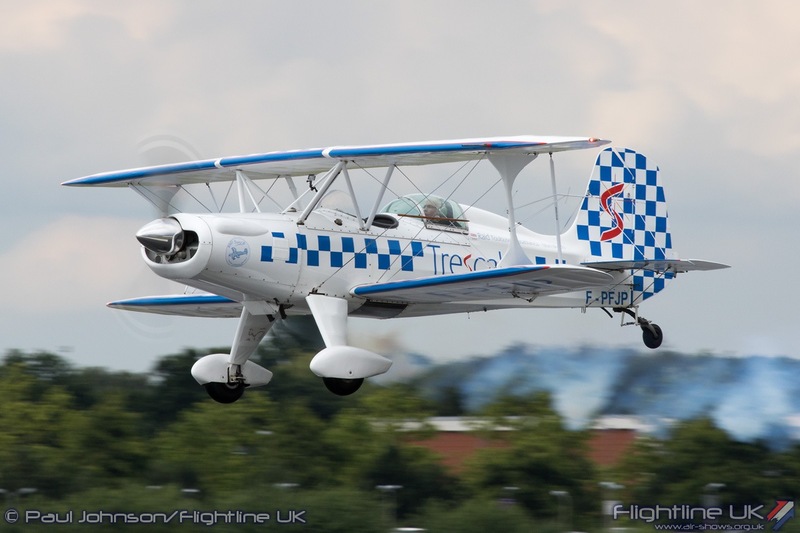 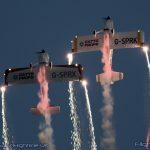 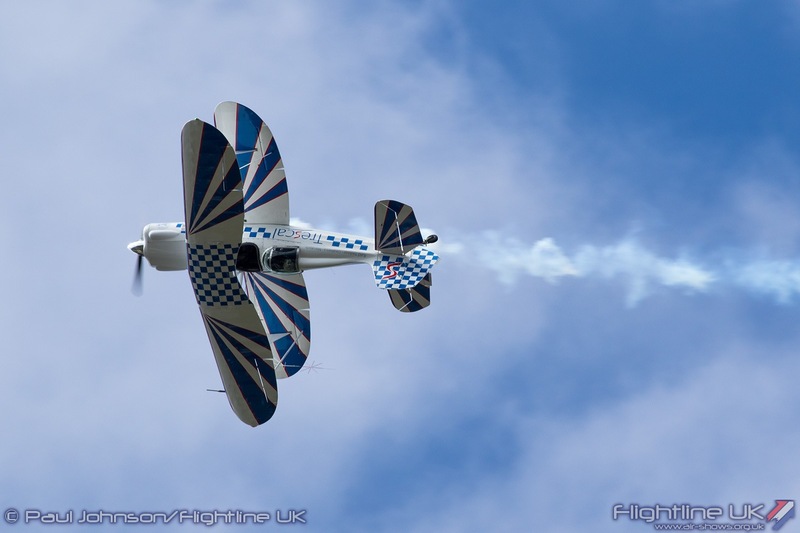 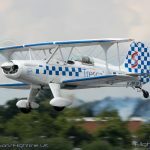 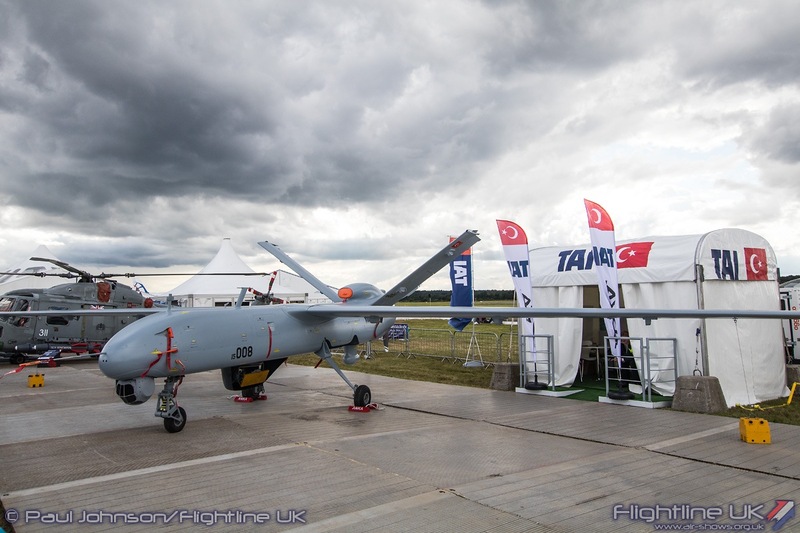 The show too had to rise to the challenge of the UK Civil Aviation Authority’s Air Display Review and some very inclement July weather. 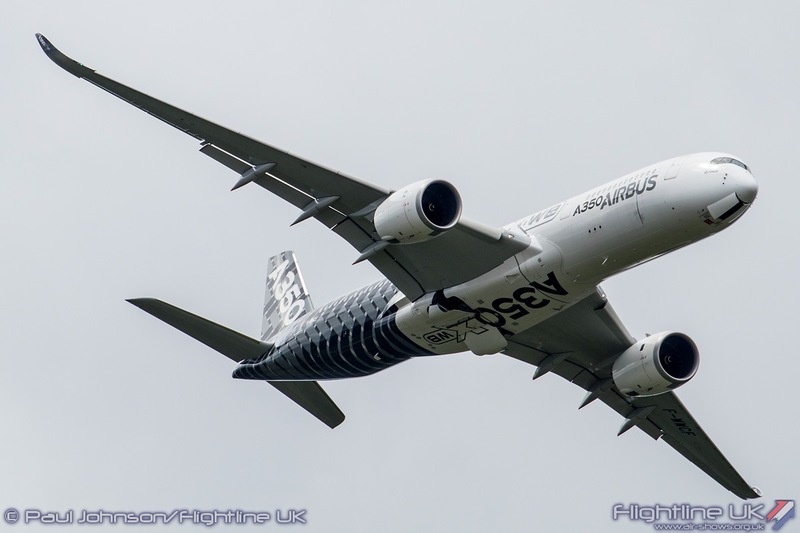 Friday is a special day for Farnborough as it is dubbed ‘Futures Day.’ The aim is to inspire the next generation into the Aerospace sector opening the exhibition space up to schools and young people. 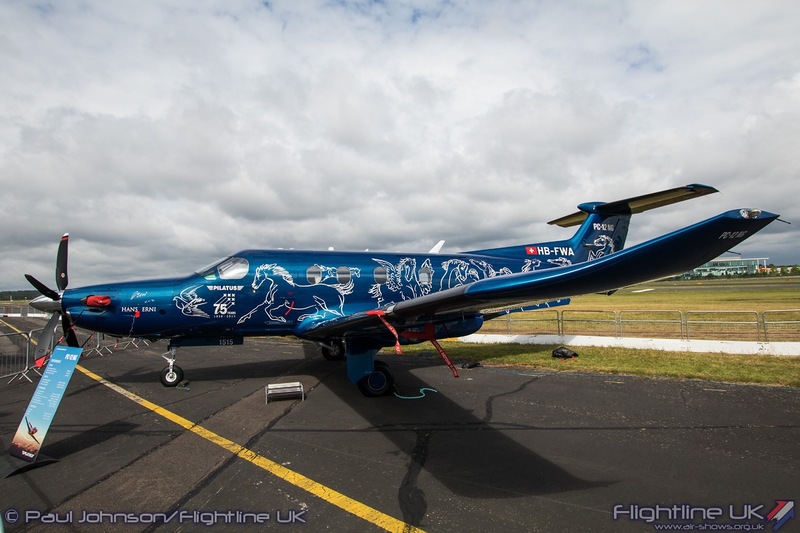 Furthermore, there are many special events too for Futures Day which this year included the first public appearance by UK Astronaut Major Tim Peake. 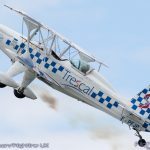 Tim’s various appearances around the show proved extremely popular with almost a rock star welcome for him wherever he appeared. 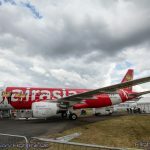 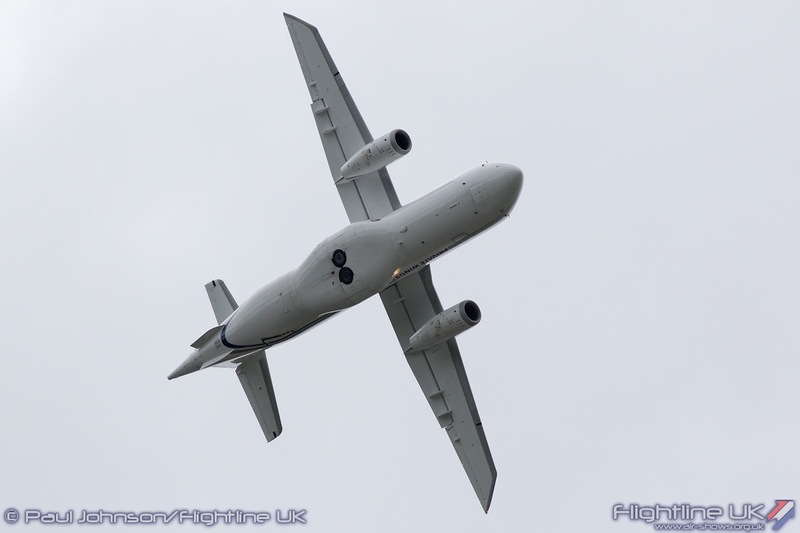 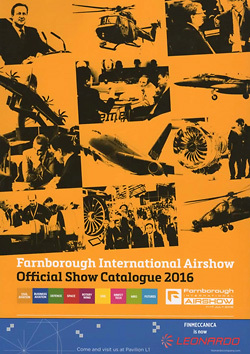 According to Farnborough’s own figures, some 110 aircraft participated at the show during the the Trade week. 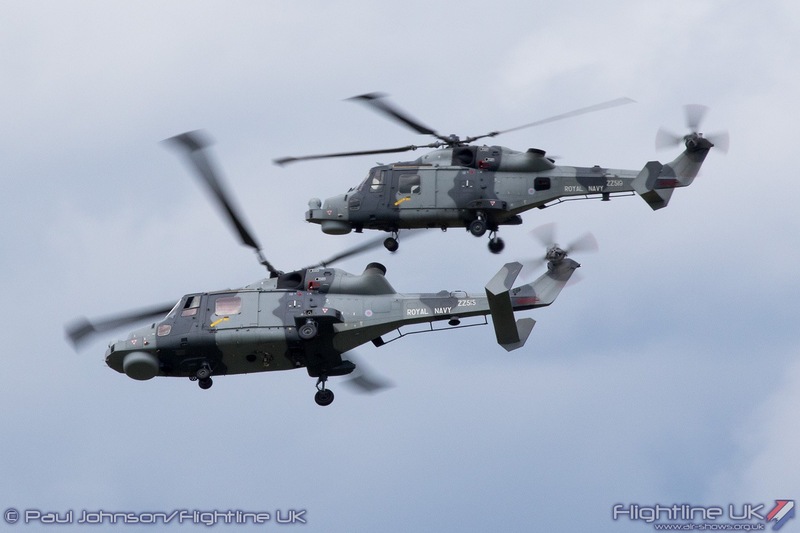 As always, the line-up of aircraft on show changed by the day as aircraft came and went. 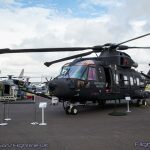 Putting an aircraft on display can be an expensive business, particularly if it is required for test programmes or is on delivery to customers. 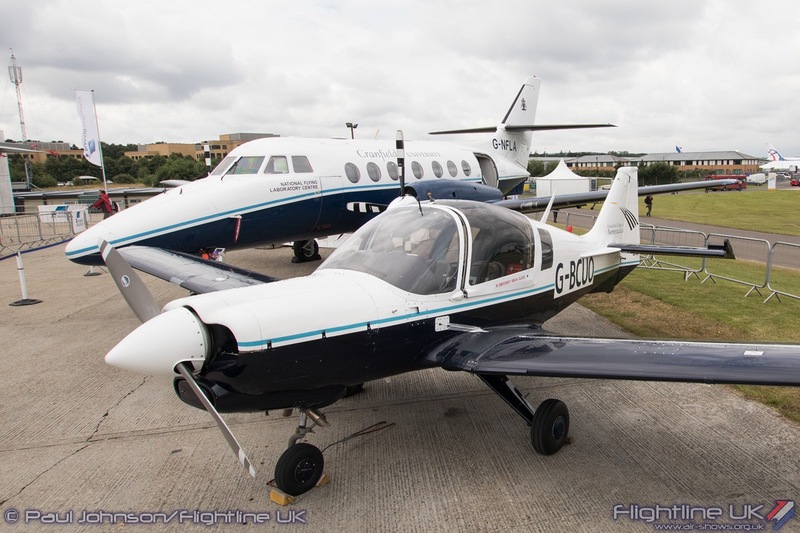 The static displays were slightly more crowded than usual by the need to move the flying display crowdline back by 25m to adhere to CAA regulations. 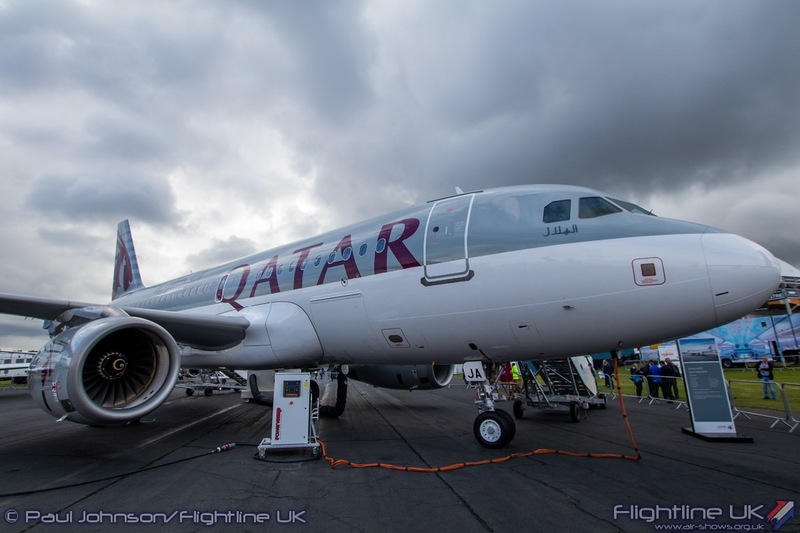 Indeed, Farnborough does suffer by not having the large open apron spaces afforded by the likes of Bahrain and the Dubai airshows. 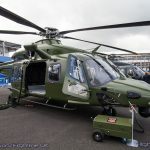 Amongst the aircraft on show in the static park were a number of debutants. 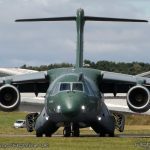 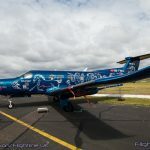 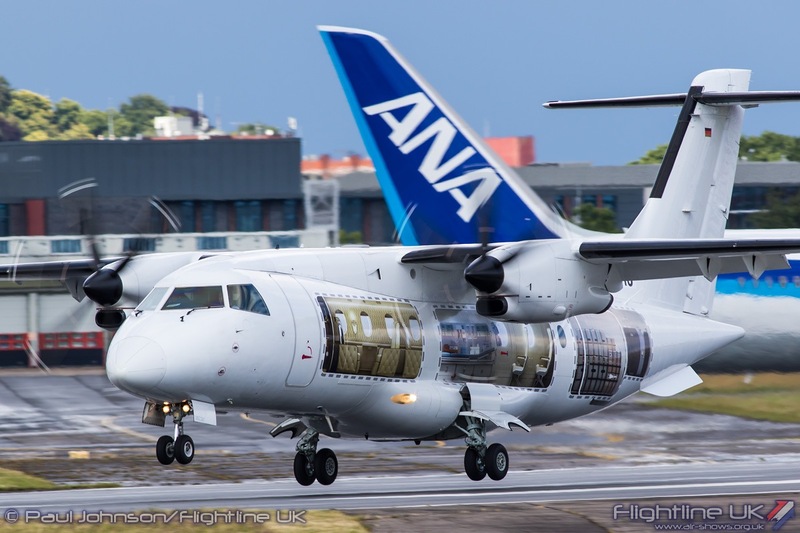 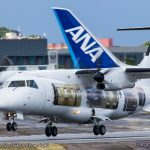 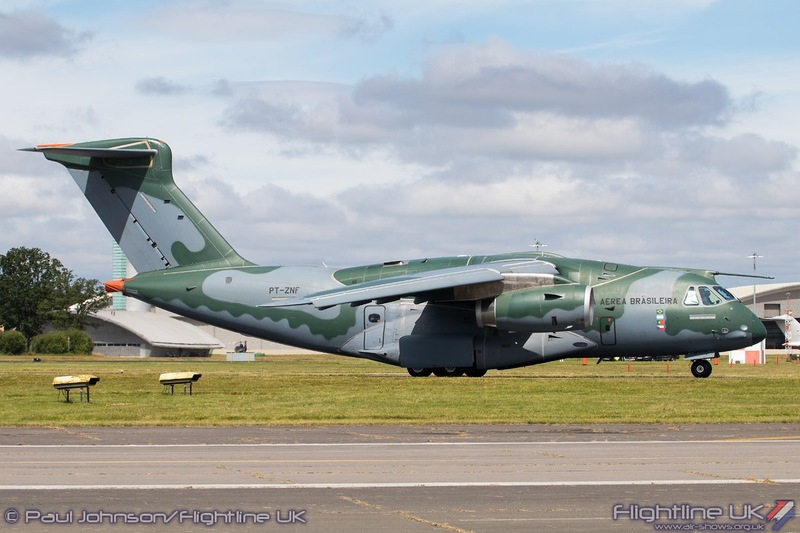 Embraer made one of the most interesting contributions with their new Embraer KC-390 making its international debut alongside the EMB-312 Super Tucano and E-190-E2 Regional Jet. 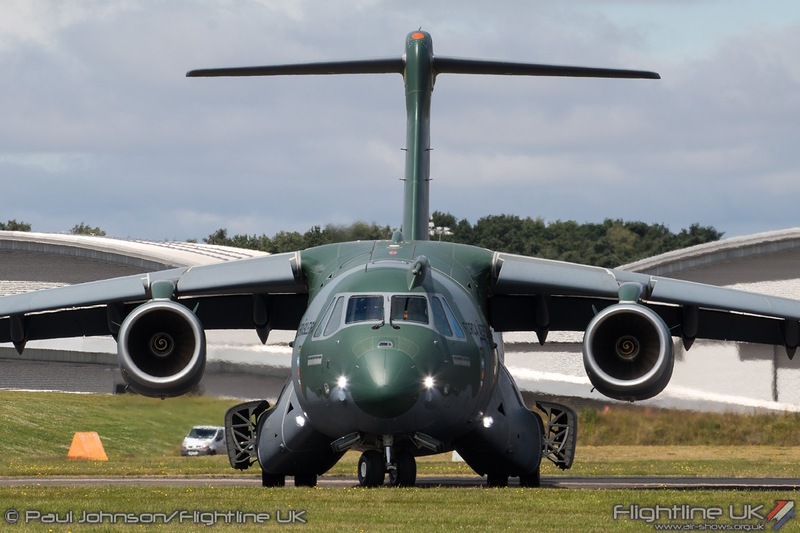 The KC-390 is a medium sized airlifter designed to replace types such as the Antonov An-26 and C-130 Hercules. 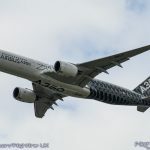 The type has already enjoyed international interest with countries such as Portugal, the Czech Republic and Argentina as well as Brazil all set in introduce the type in the years ahead. 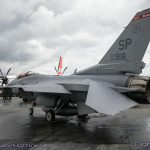 The United States Department of Defence also made a significant contribution to the military line-up on static display with a US Navy Boeing F/A-18E Super Hornet, a pair of USAF Lockheed Martin F-16CJ Fighting Falcons, a US ANG CC-130J Hercules II, US Army UH-60A Blackhawk and perhaps most notably a HC-27J Spartan from the US Coast Guard. 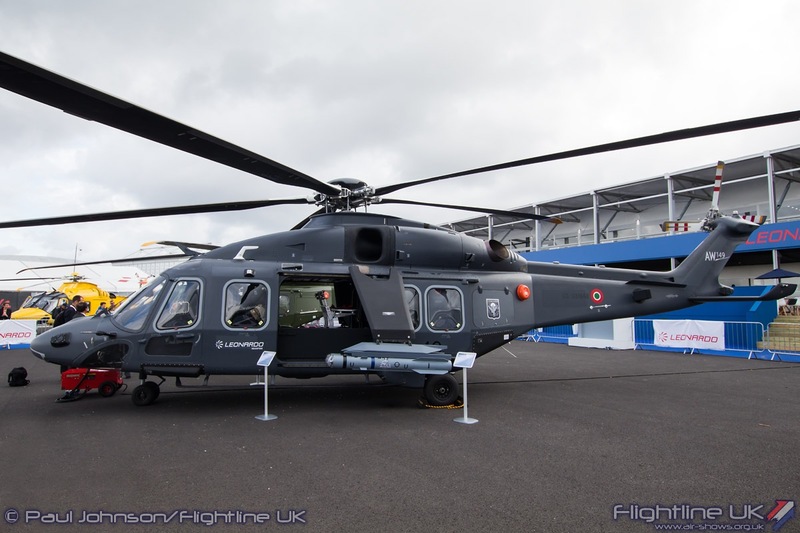 New to Farnborough is the brand “Leonardo” which is the new name for the Finmeccanica group of companies. 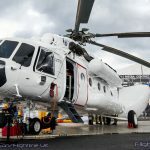 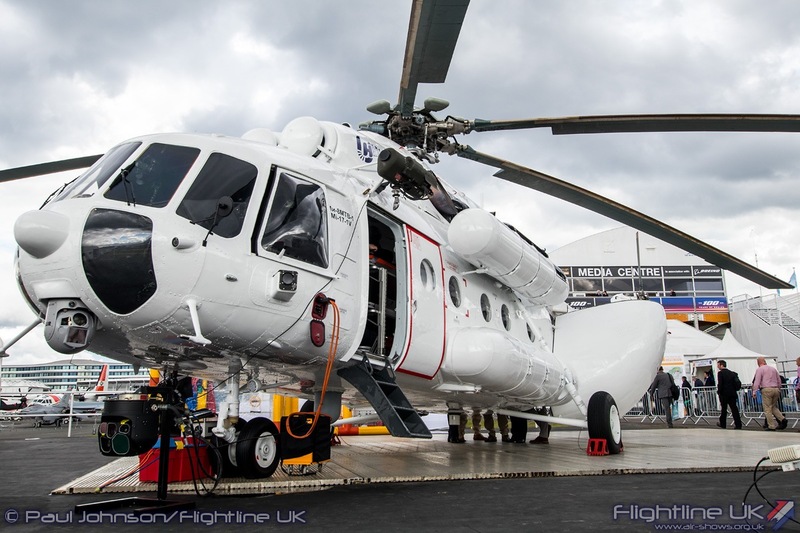 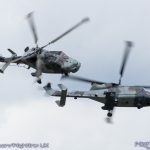 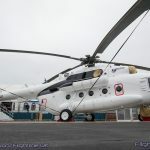 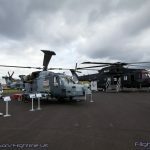 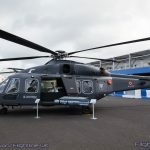 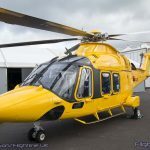 They had their traditional big exhibition area and at the main Gate B entrance to the airshow which a sizable static display of their products including the MC-27J Spartan, HH-101A Ceaser Combat Search and Rescue helicopter, the AW159 Wildcat HMA2, AW149, AW169 and AW189 helicopters in show. 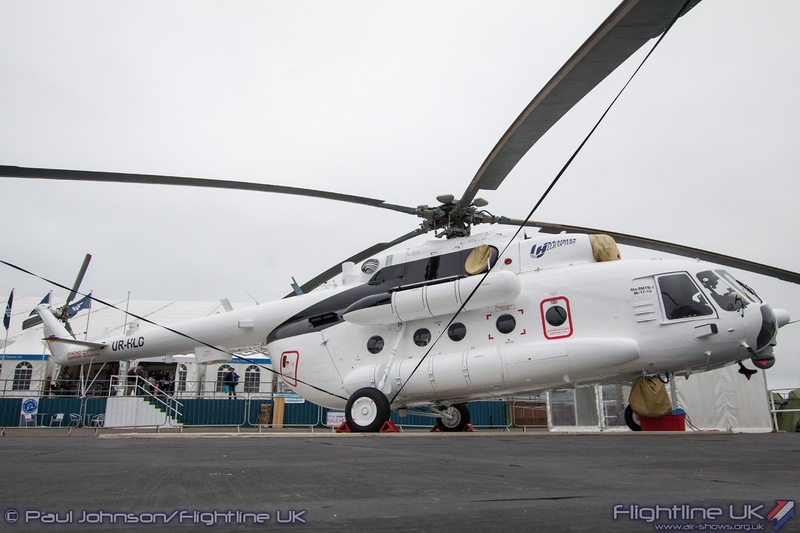 Ukrainian Helicopters also had a noticeable presence on the main road past the halls with an all-white Mil Mi-8 Hip helicopter on display. 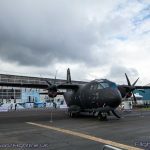 Airbus too had some military aircraft on show was a Portuguese Air Force CN295MP and their CN295W demonstrator parked alongside their commercial products. 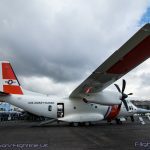 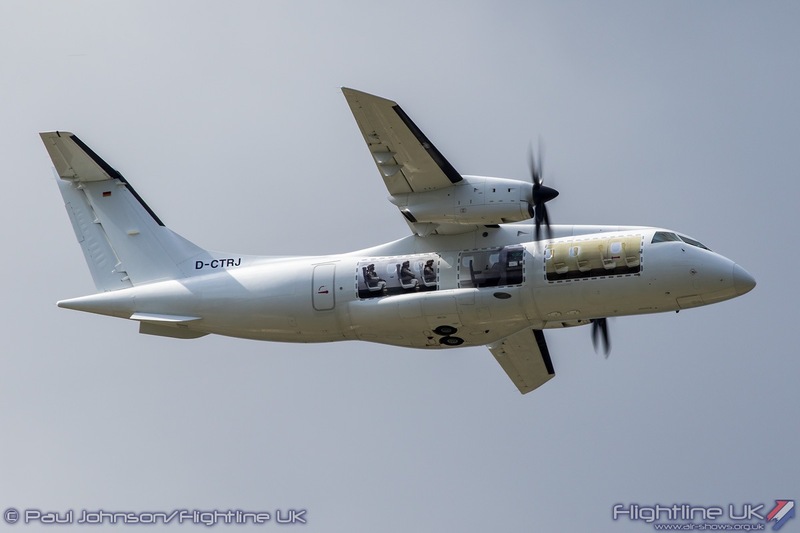 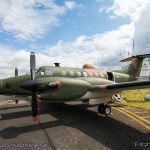 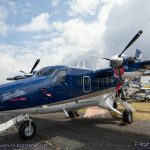 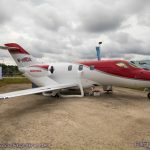 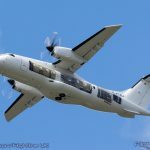 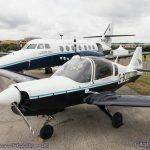 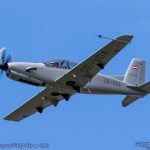 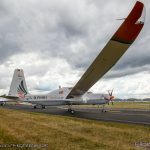 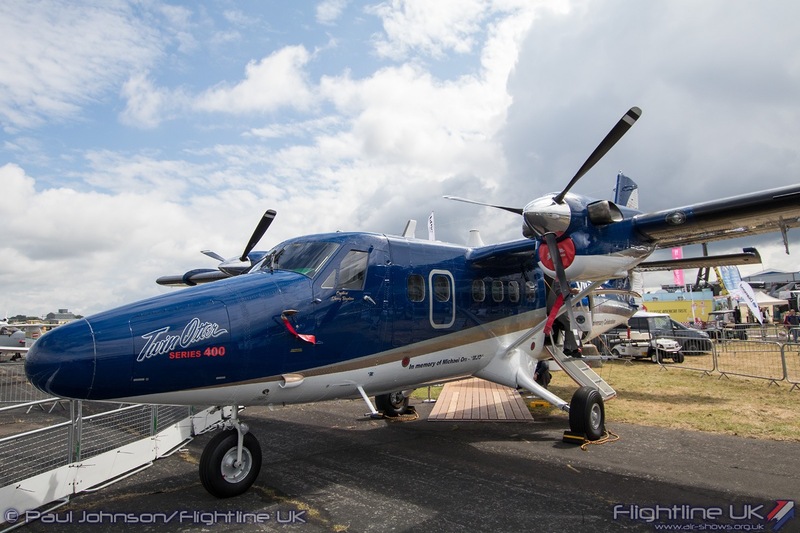 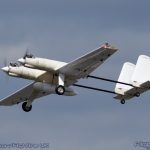 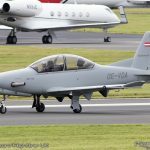 Other familiar shapes in the static line included the Viking Air Twin Otter, Pilatus PC-21 and Pilatus PC12NG, various surveillance developments from Diamond Aviation plus the Grob G520T Egrett and G120TP Prefect. 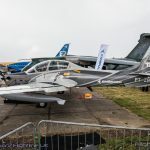 Textron had their usual exhibition space right at the far end of the airshow site with their collection of AirLand Scorpion and Special Missions Cessna 208 Caravan and King Air 350i on display. 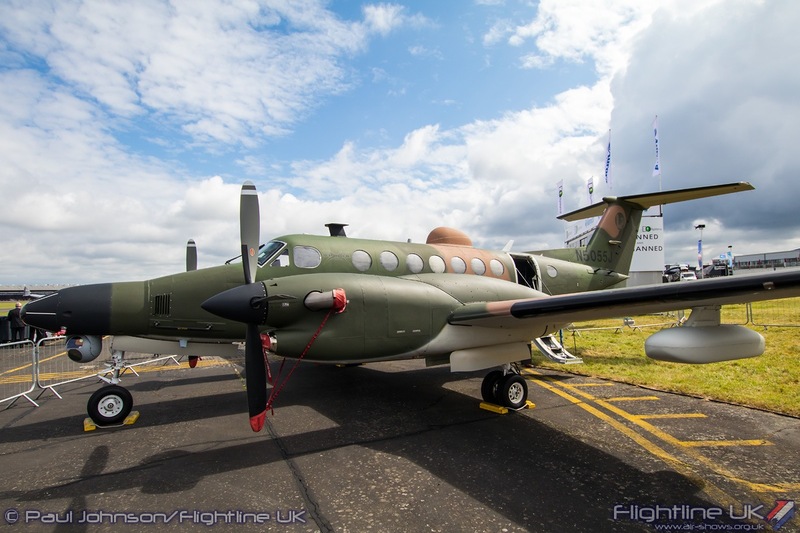 L3 Communications also had their King Air derived Spyder surveillance platform in their static display. 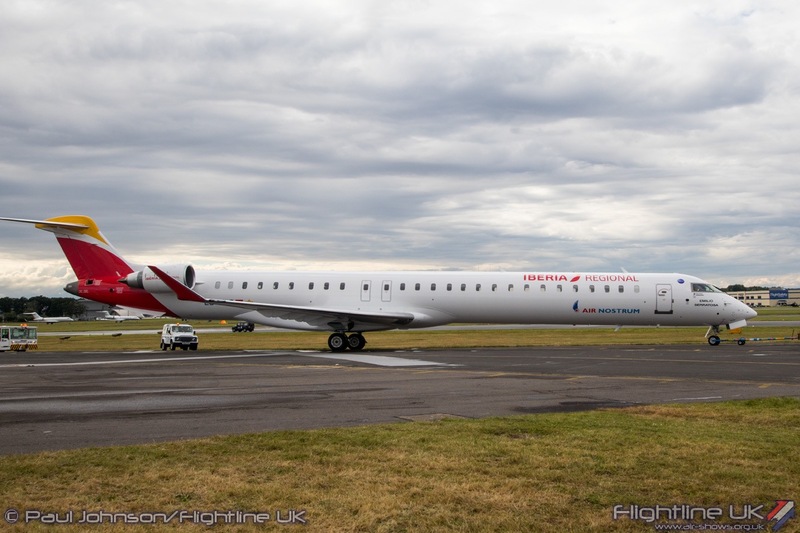 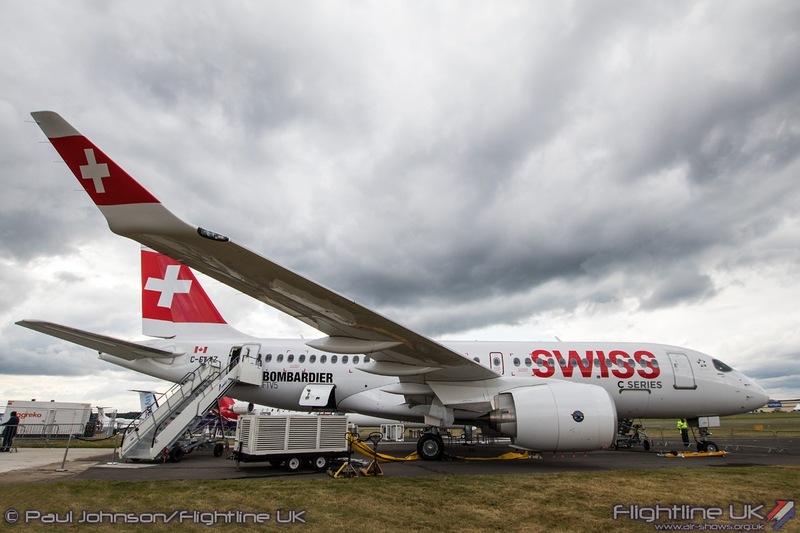 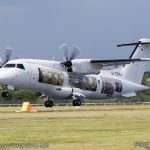 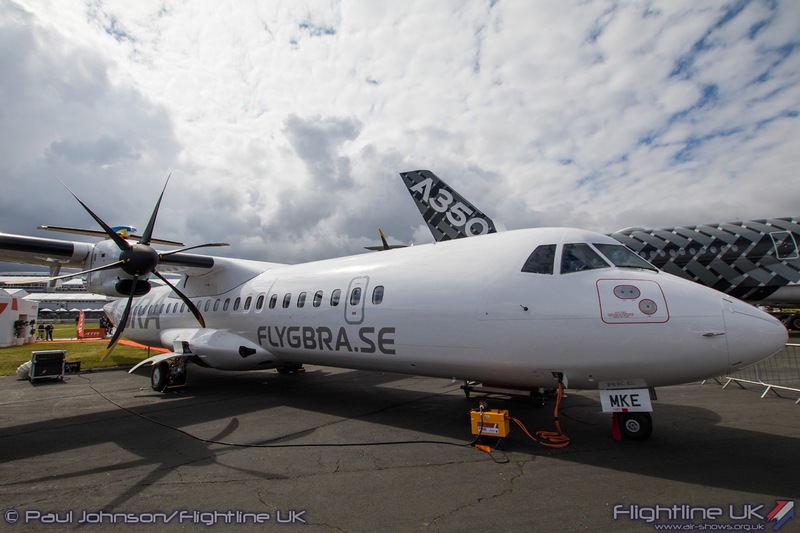 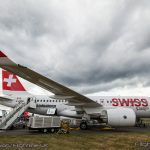 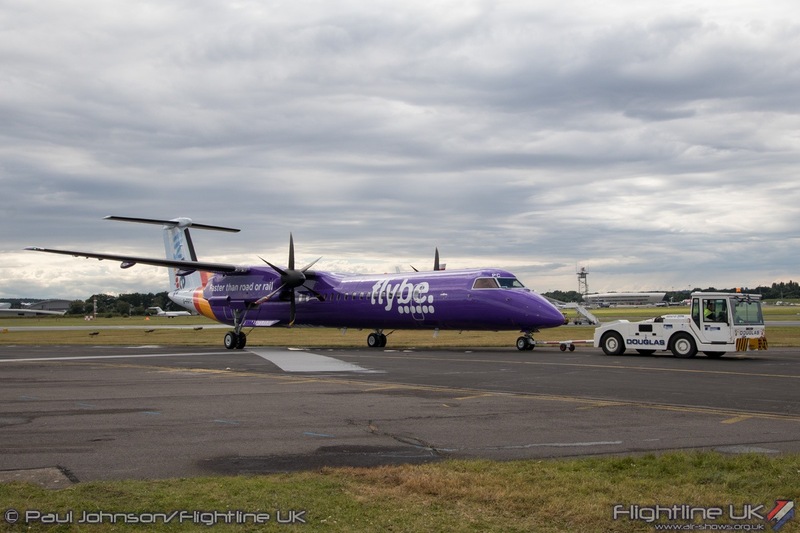 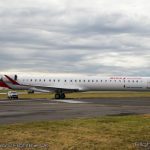 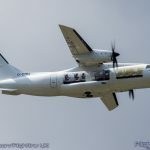 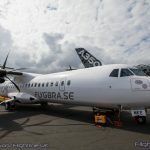 From the commercial sector, it was left to Bombardier to provide the newest shape within the static displays with a Swiss Airlines C-Series 100 making its Farnborough debut alongside the more familiar CRJ1000 and Dash-8 Q400. 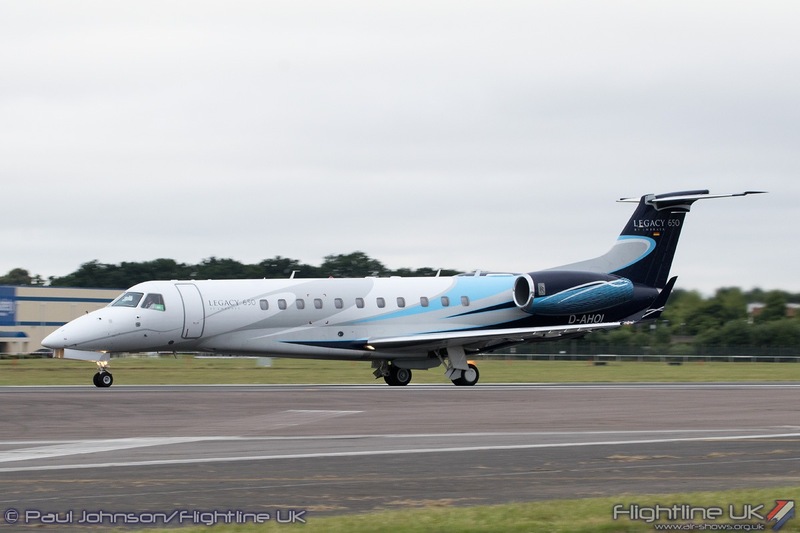 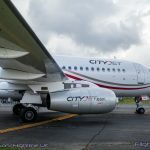 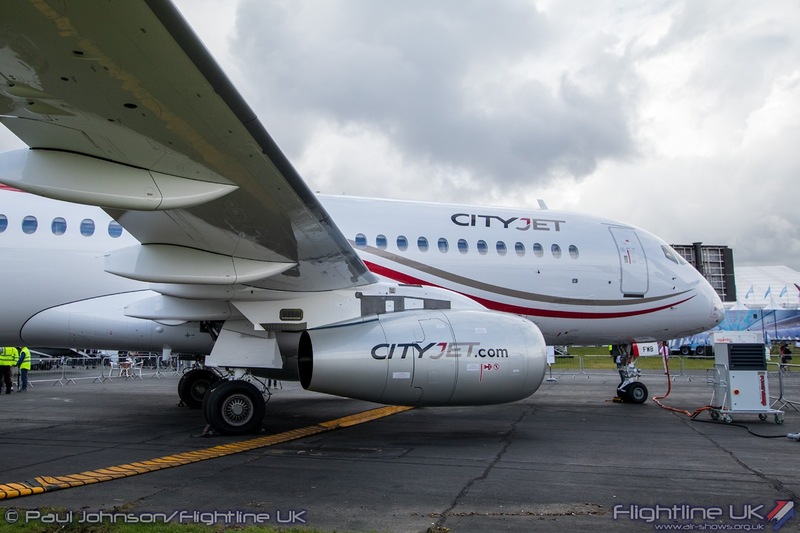 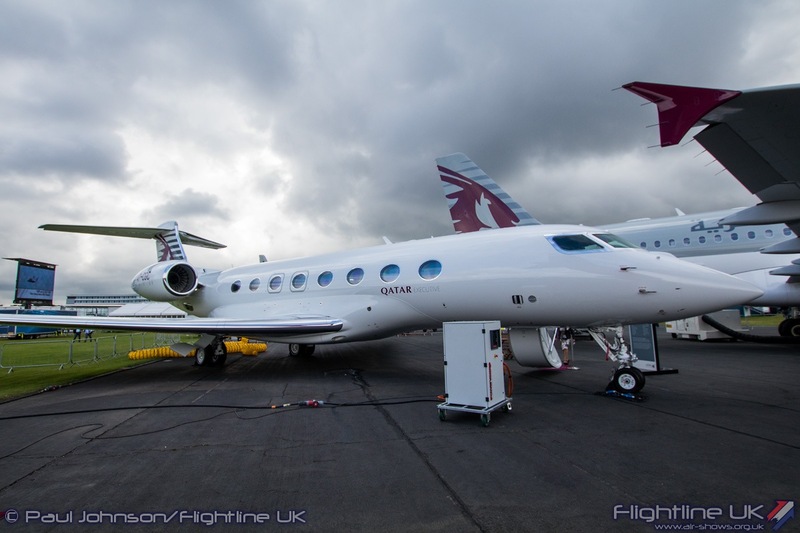 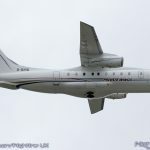 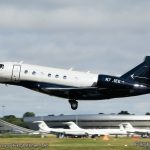 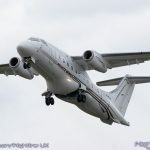 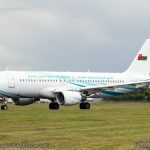 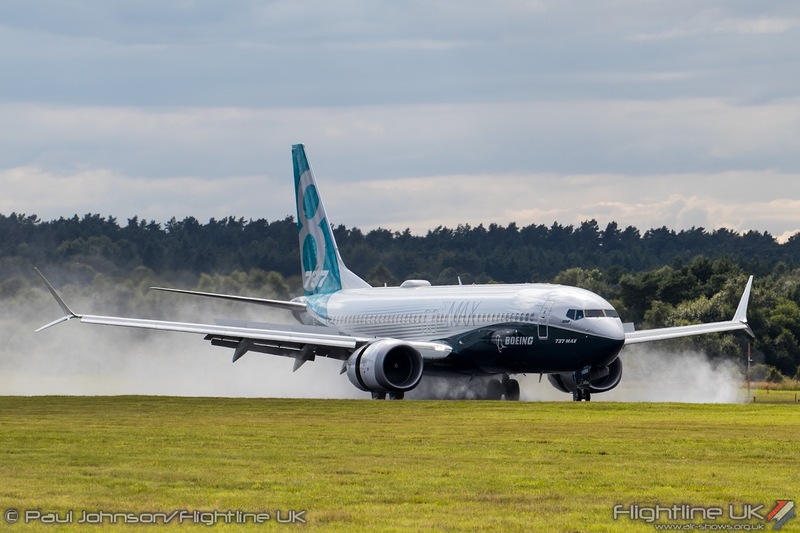 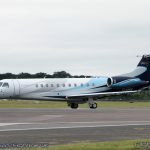 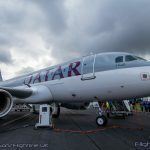 Possibly thanks to Farnborough new guise as a major Business Airport, the Business and Corporate Jet sector has started to dominate the static displays. 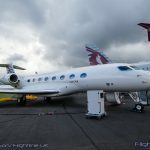 Amongst the lines of Gulfstreams, Dassault Falcons and Bombardier types were debuts from the Gulfstream G500 and HondaJet. 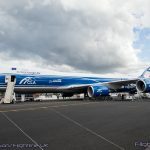 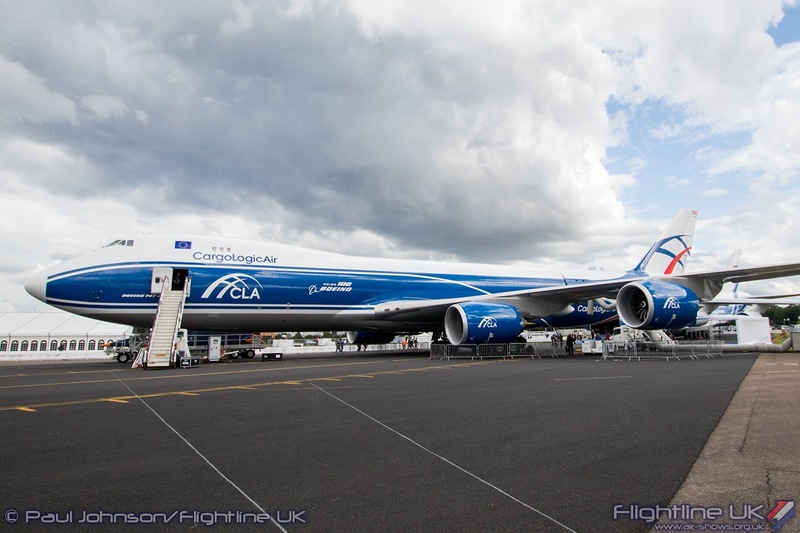 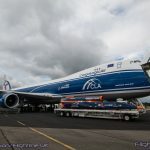 Cargo carriers Volga-Dnepr also had a large presence on the ground with perhaps two largest types in the display. 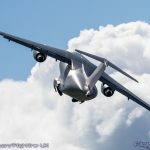 It has been a good few years since the Antonov An-124 has been seen on static. 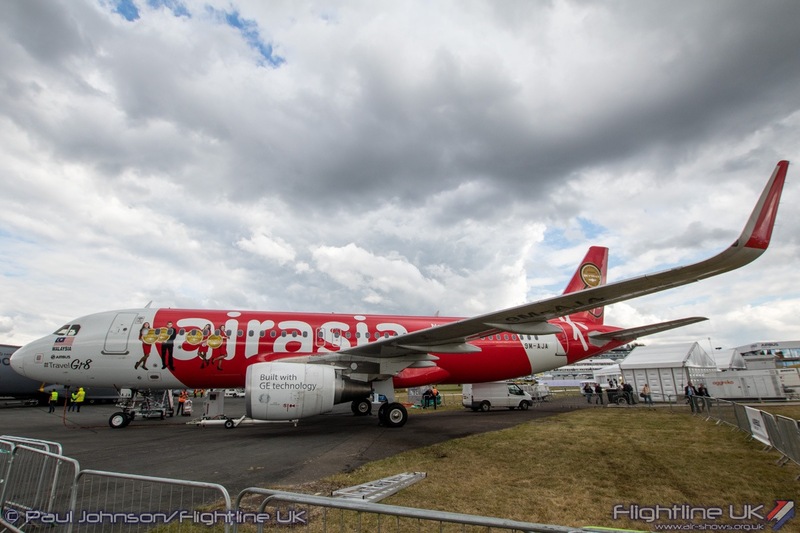 The type made its UK debut at Farnborough after the Cold War ended when it was exhibited alongside many other Eastern-bloc types. 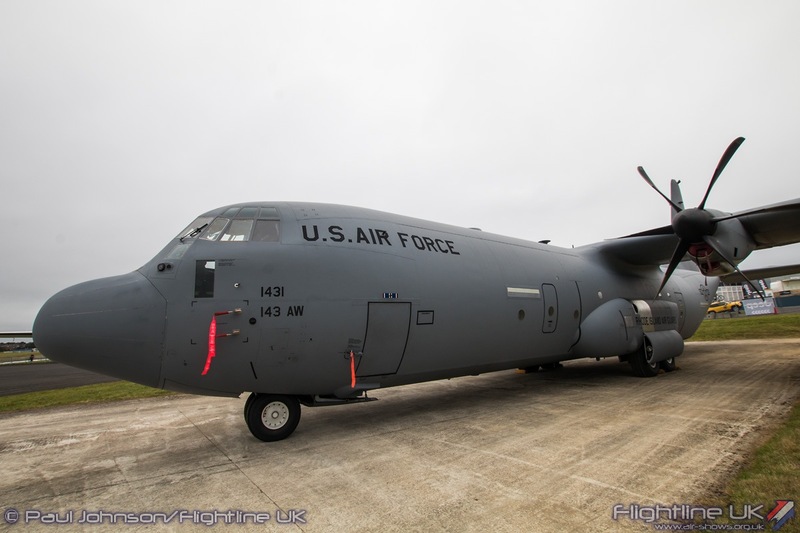 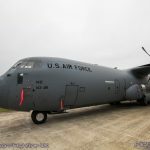 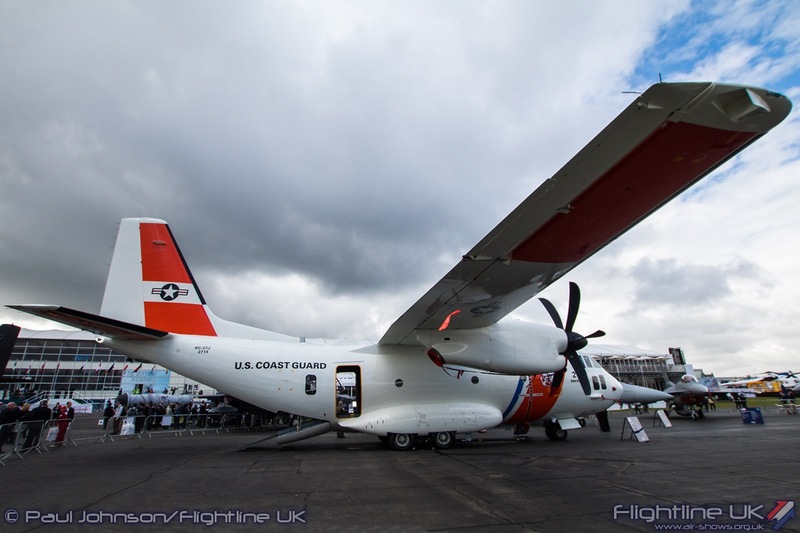 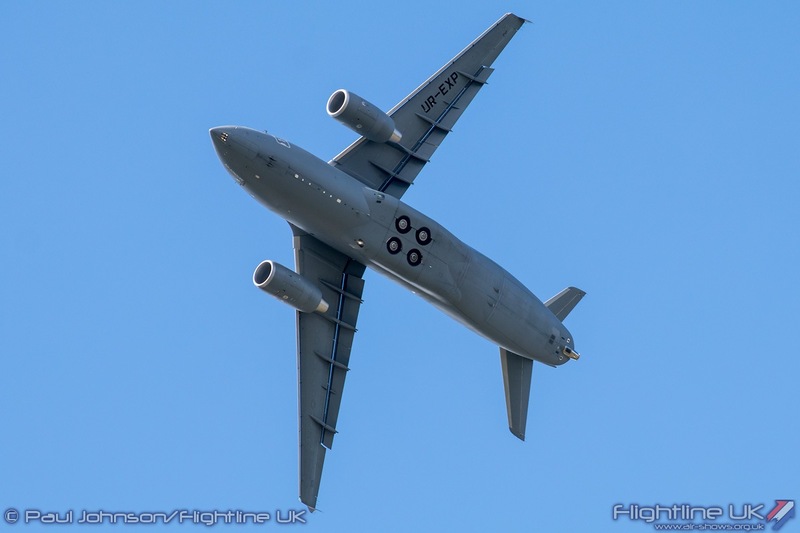 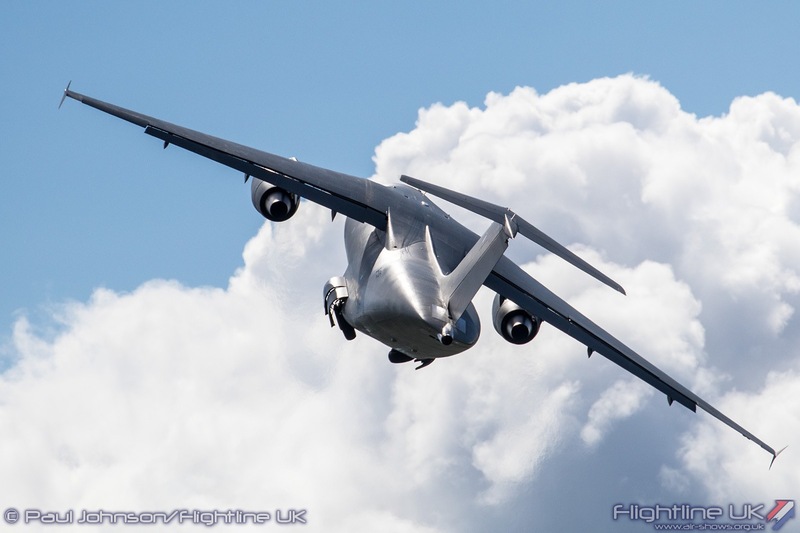 The large out-size Cargo lifter however has since become a popular visitor to the UK supporting civilian and military charters around the world. 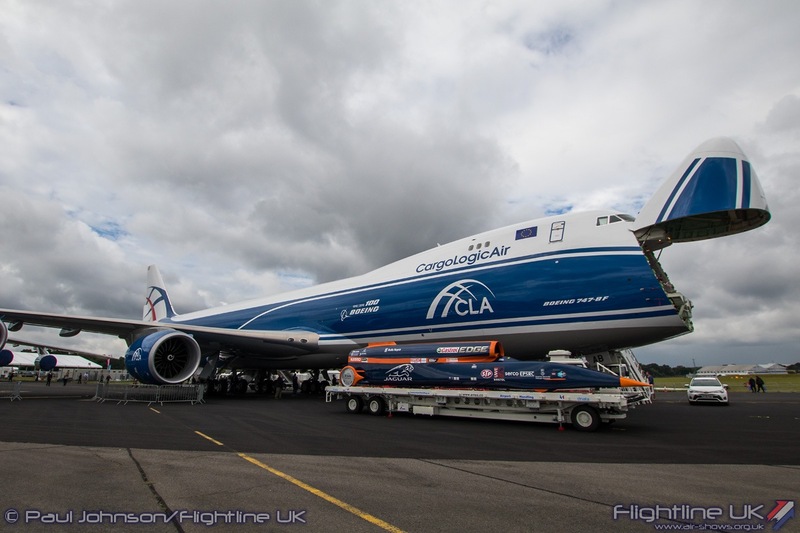 Alongside the Antonov was Boeing latest cargo-lifter, the Boeing 747-8F. 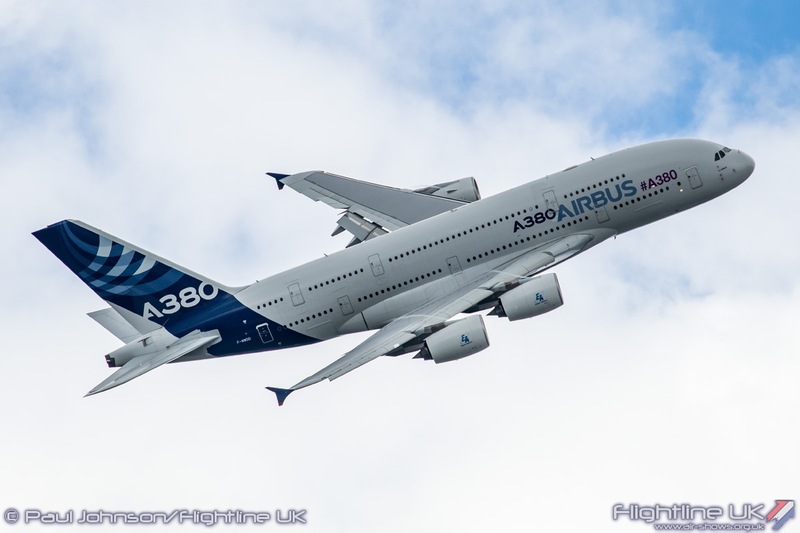 Bigger with new wings and engines, the new generation of 747 is far more efficient that older models. 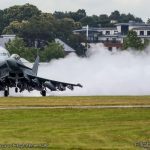 Despite the curtailment on the opening Monday due to weather, each afternoon saw the traditional Farnborough flying display. 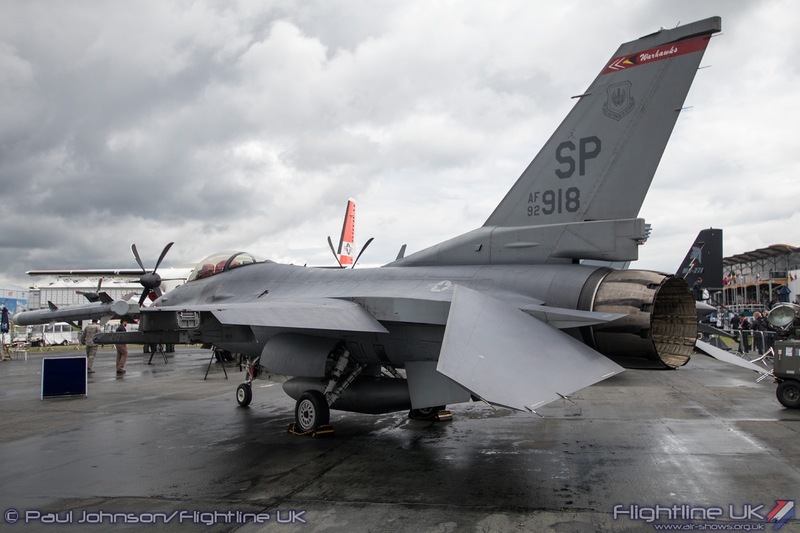 These varied considerably from day-to-day depending on which aircraft and crews were available to display. 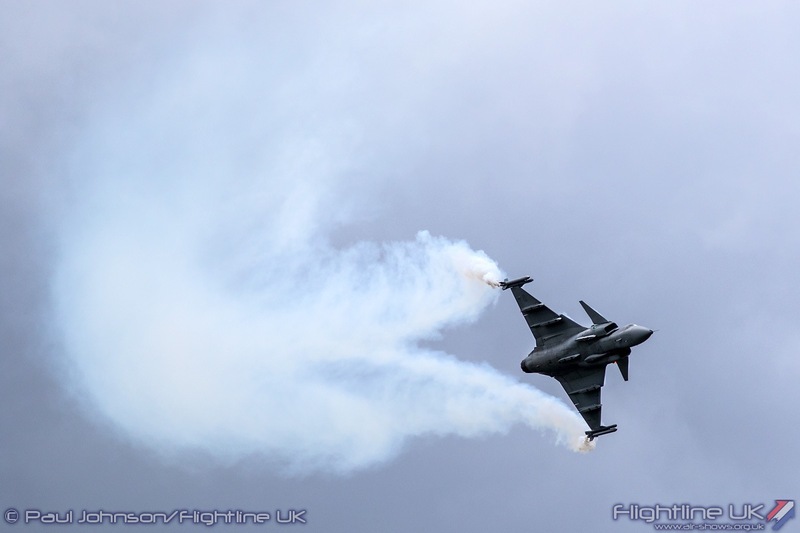 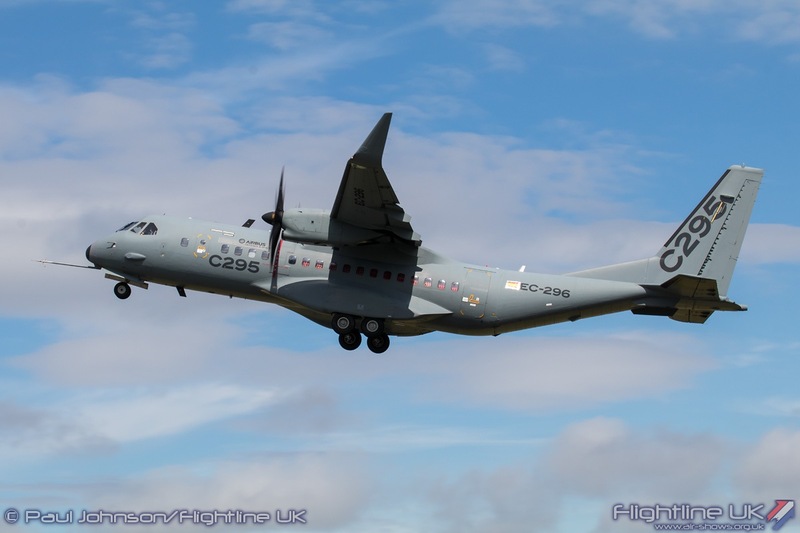 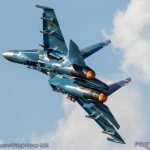 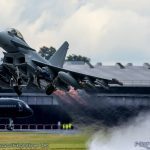 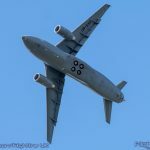 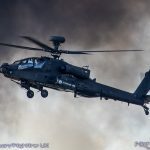 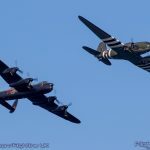 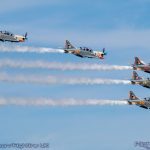 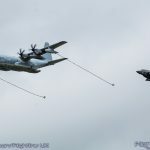 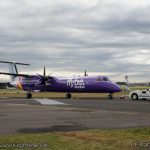 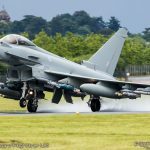 It is not uncommon for certain displays to take rest days during the week, particularly if aircraft and crews had also been participating at the Royal International Air Tattoo the weekend before Farnborough. 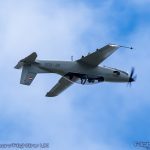 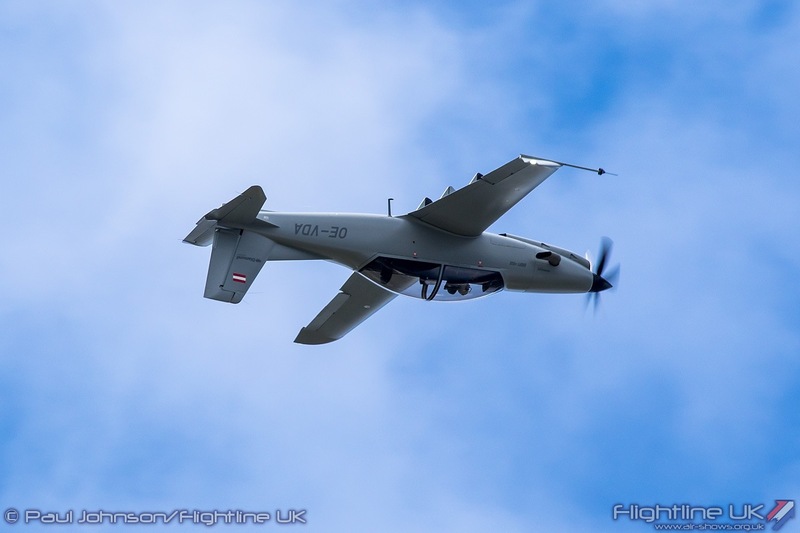 Prior to the main flying displays, there was an opportunity for Unmanned Aerial Vehicle demonstration. 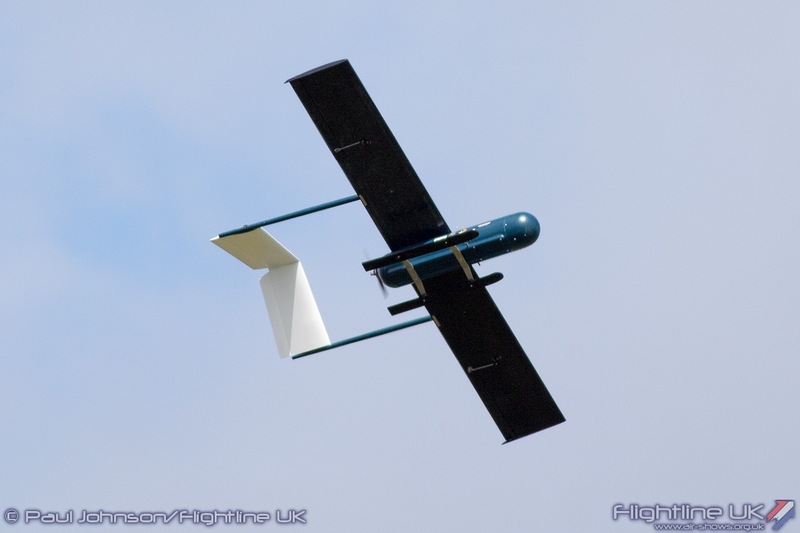 In the main, these are very small machines such as the Tekever AR4, Prospero and the Southampton University Spotter. 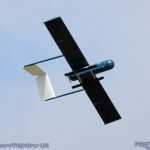 One of the more remarkable types was “Robo-bird.” This is a true “orthihopter” which means it flies by flapping its wings. 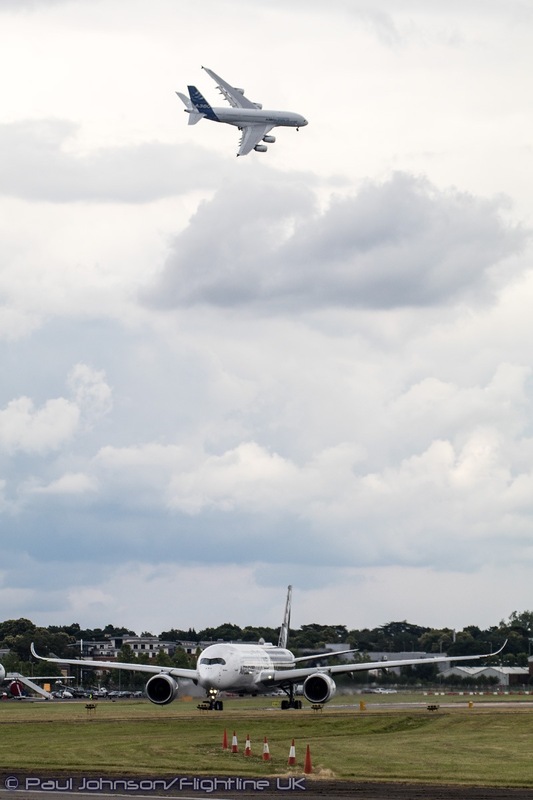 In fact “Robo-bird” is a very lifelike representation of a Peregrine Falcon and is used for bird-scaring duties. 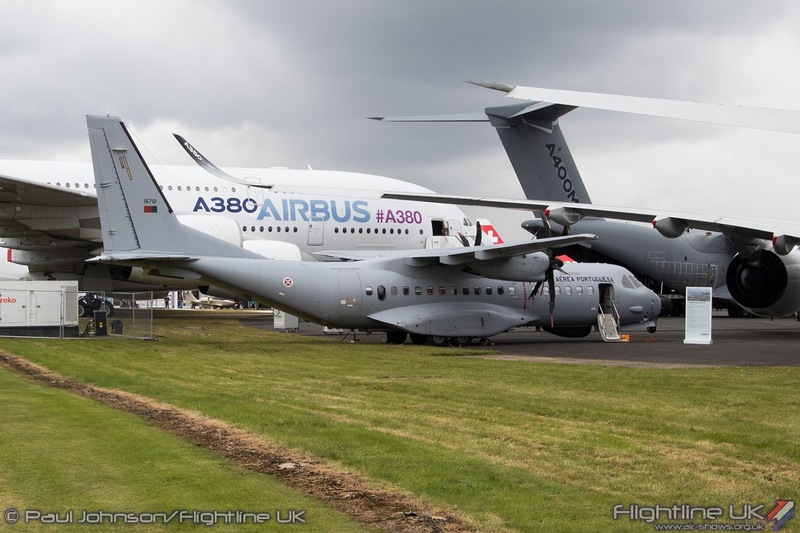 Opening the main flying display was Airbus. 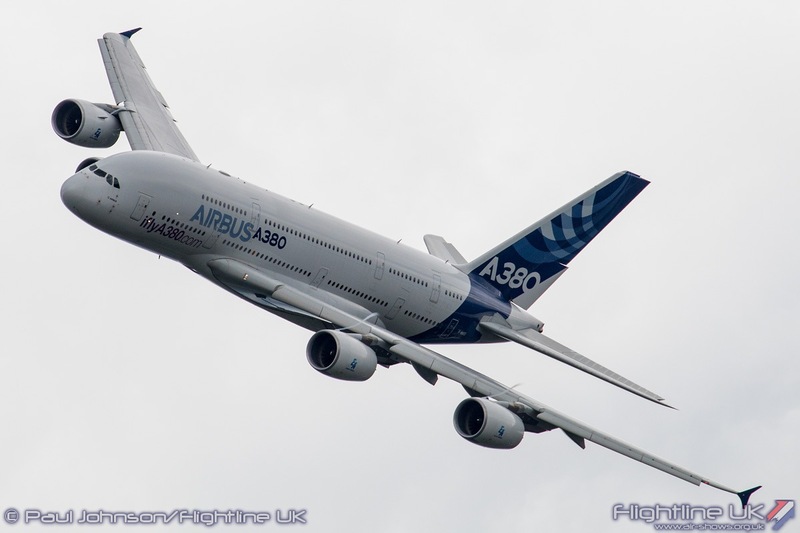 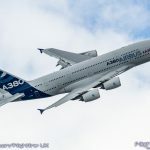 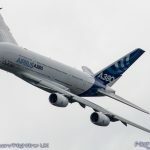 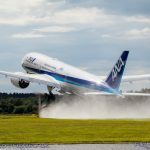 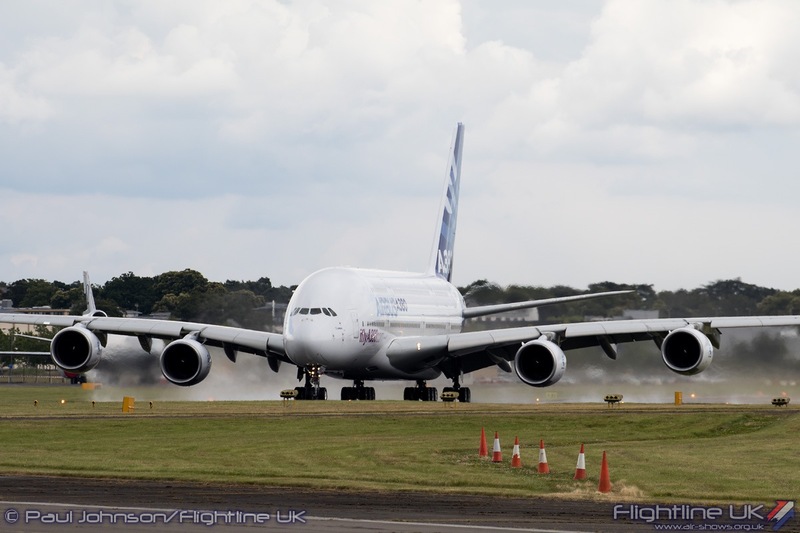 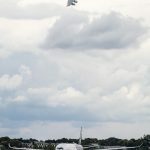 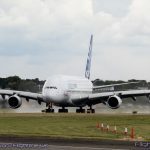 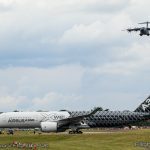 The Airbus A380 has become a firm fixture at Farnborough for 10 years, but still never ceases to amaze with its agility during it graceful display routine. 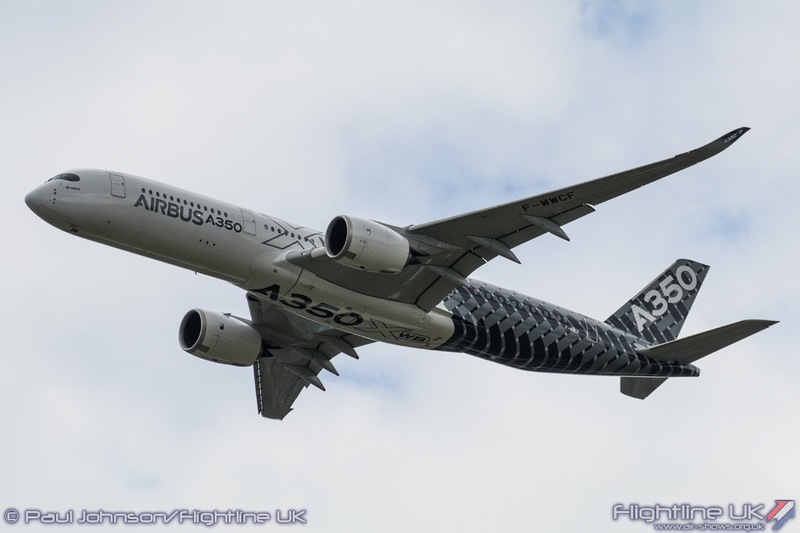 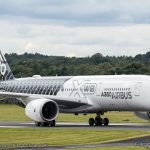 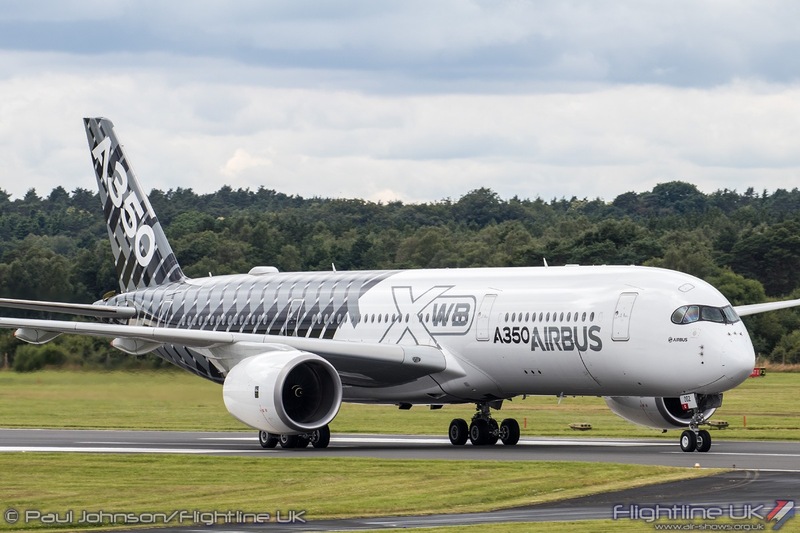 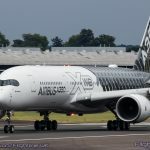 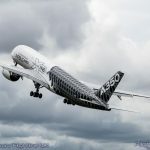 A fur newer shape is the Airbus A350-900. 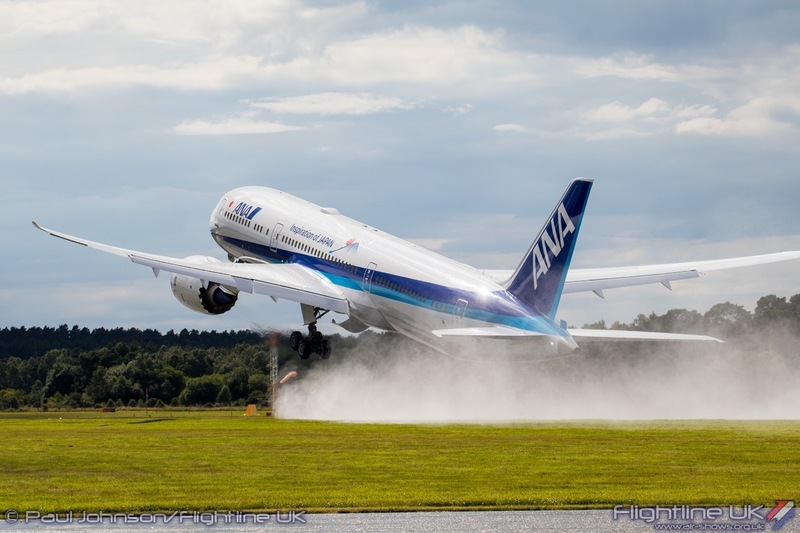 The type made its Farnborough debut two years ago and continues to attract interest. 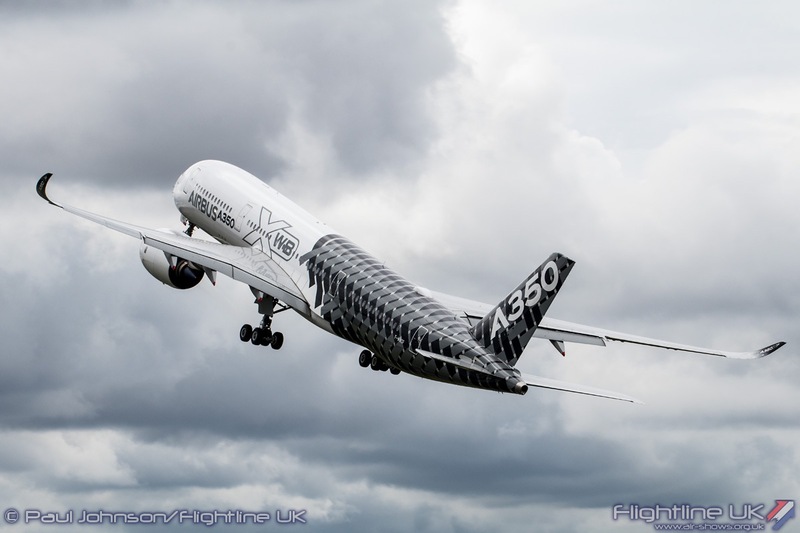 Indeed, Virgin Atlantic placed an order for the A350-1000 on the opening day of the show. 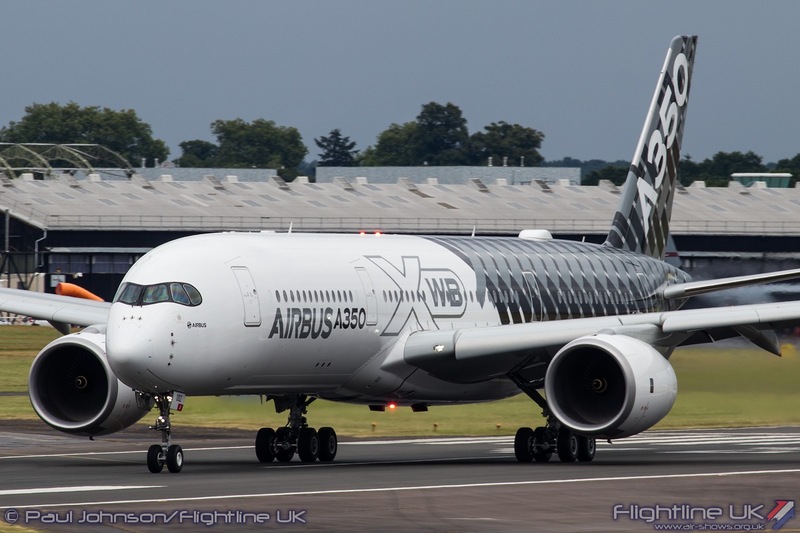 Like the A380, the A350 shows some impressive agility, particularly on take-off. 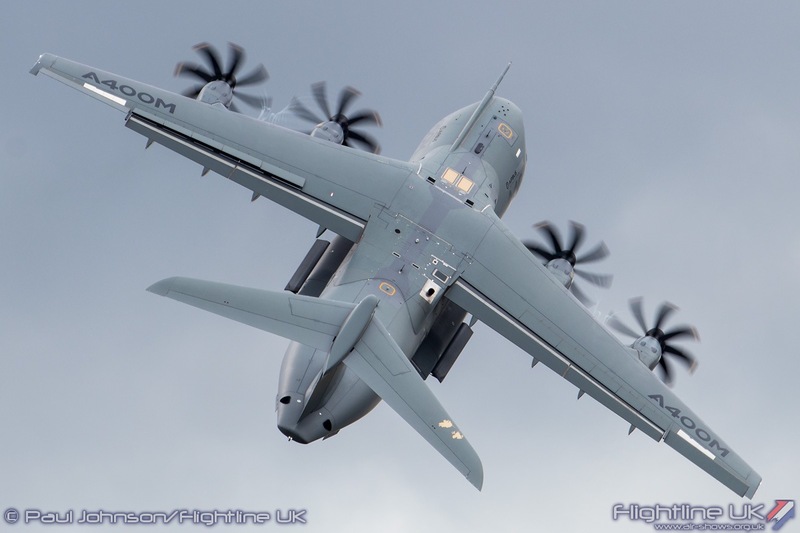 Closing the Airbus segment of flying was the Airbus A400M military airlifter. 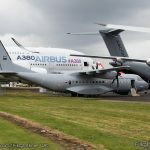 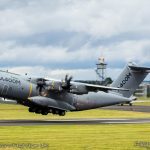 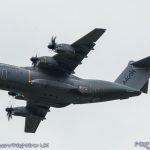 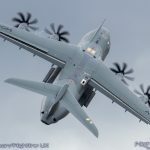 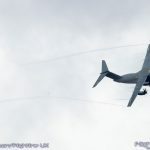 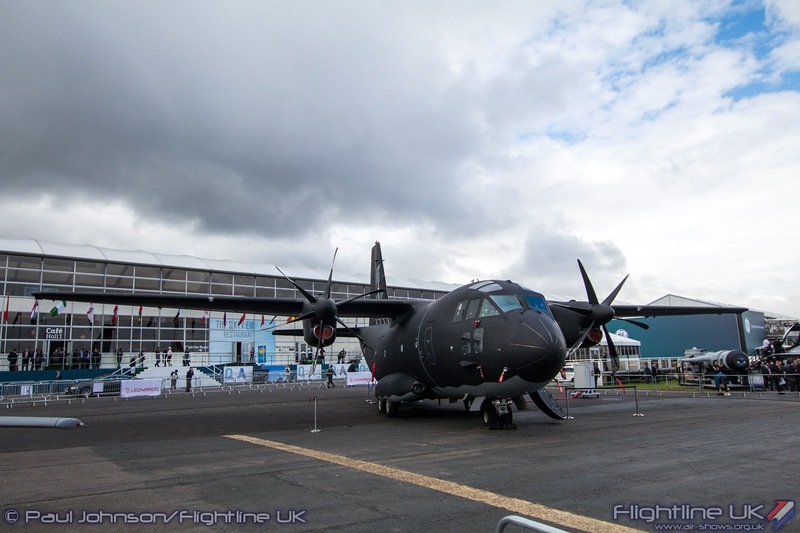 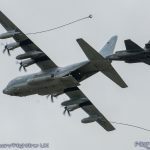 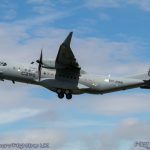 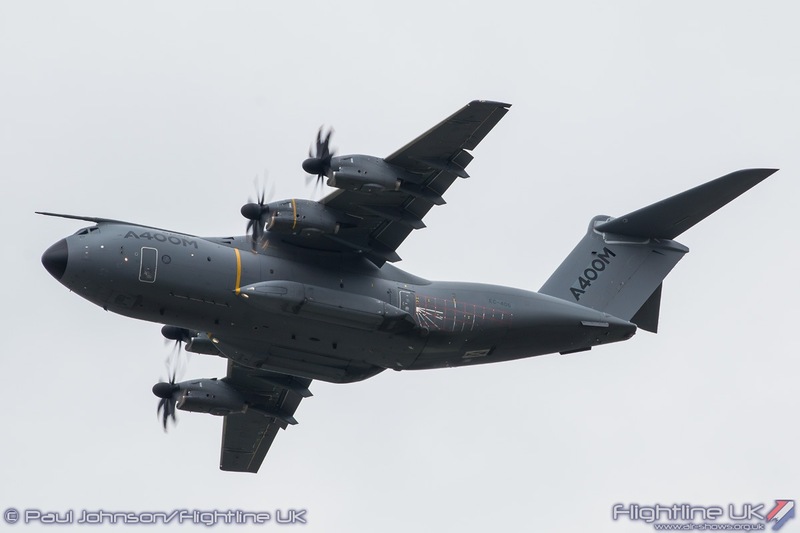 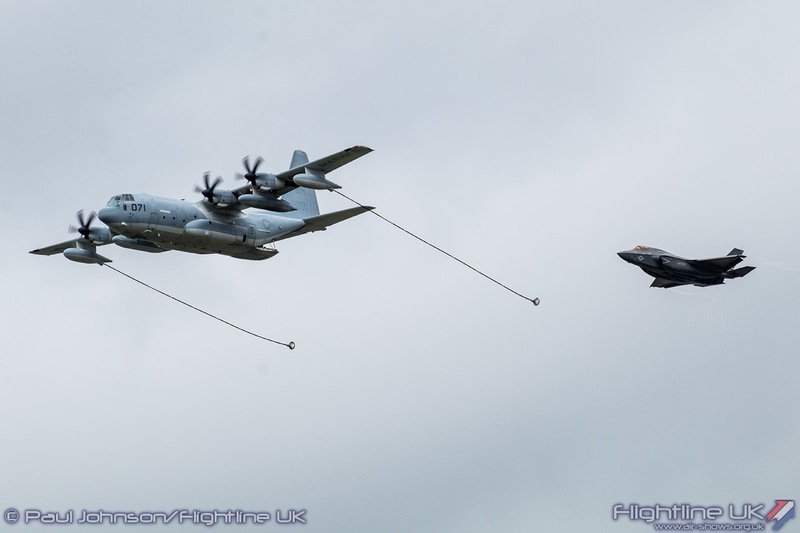 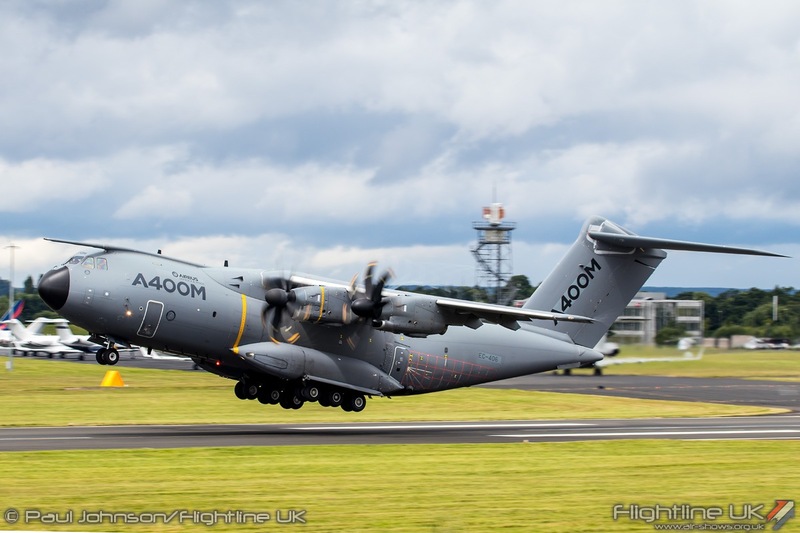 Farnborough’s strict display regulations clipped the A400M’s display routine that was seen at RIAT but it was nevertheless an impressive display of the big transporter which is very near aerobatic! 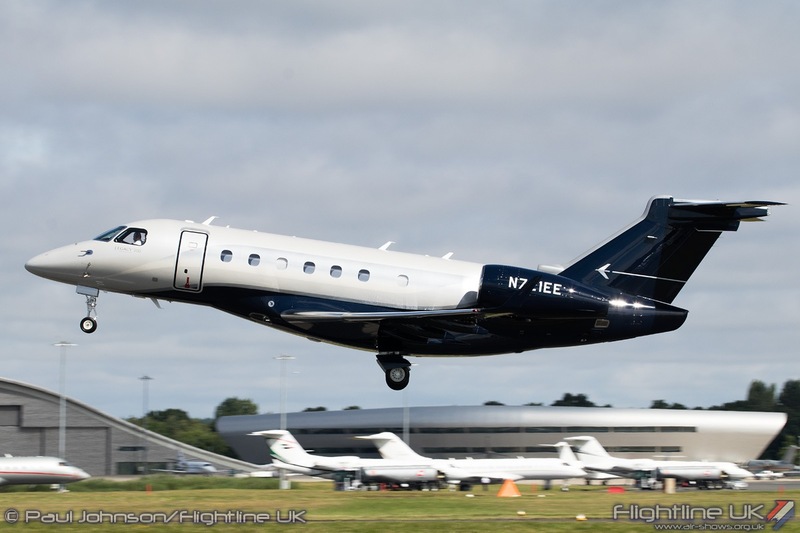 Farnborough tends to group fast jet displays together during the week as it is easier to coordinate the extra airspace they need with nearby Heathrow. 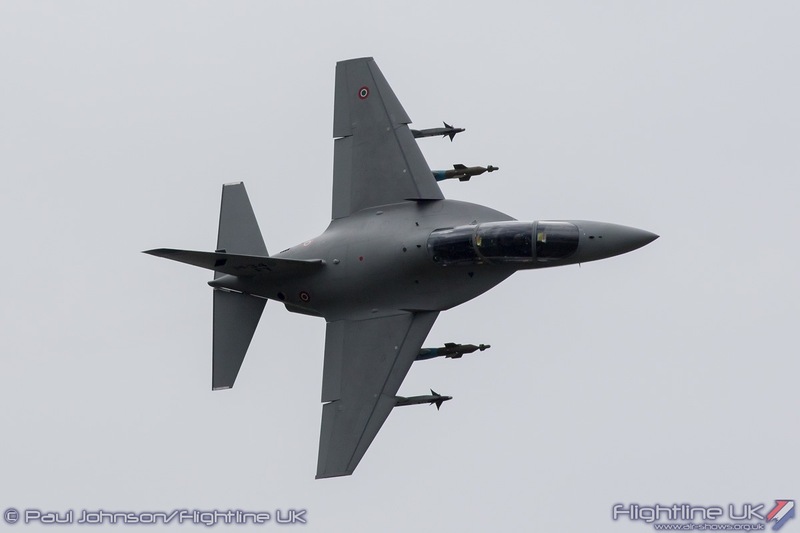 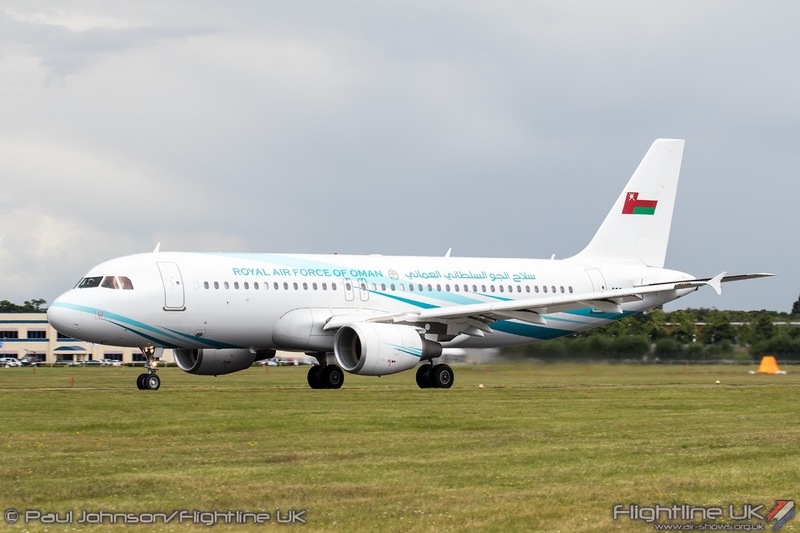 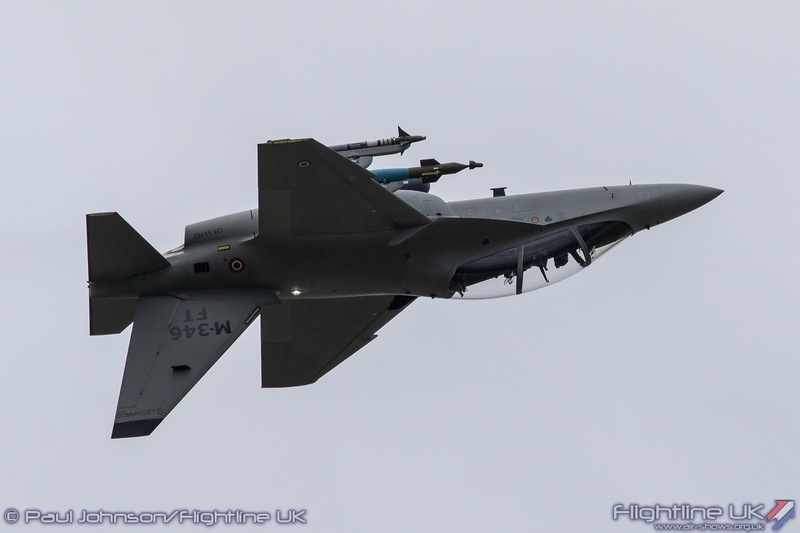 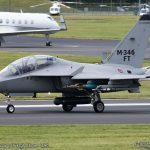 Opening the sequence of Fast Jet displays on Tuesday was the Leonardo M346FT Master. 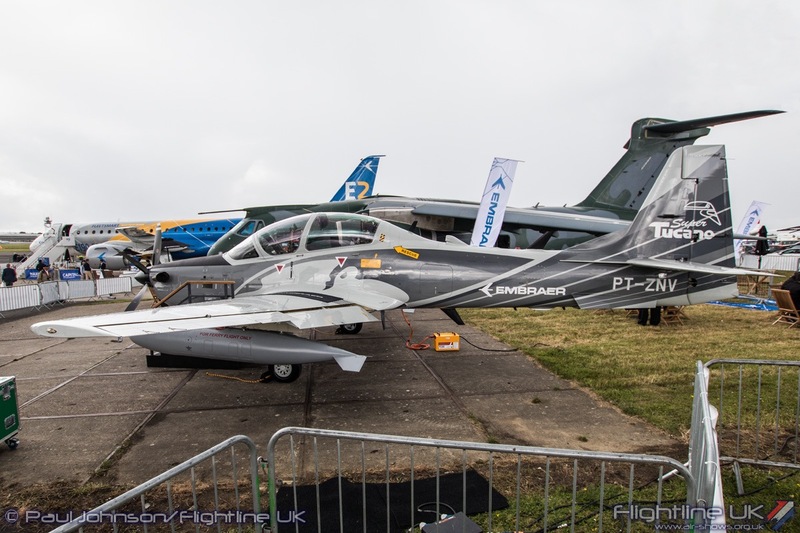 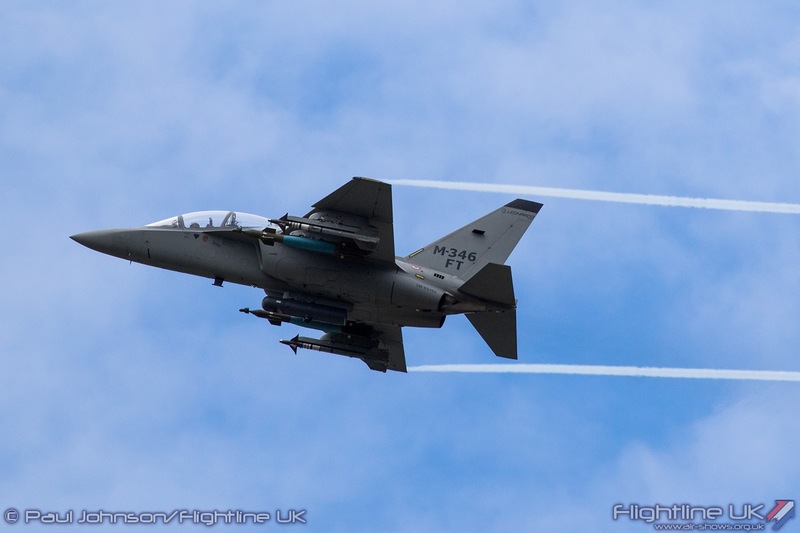 This variant of the advanced jet trainer was launched at Farnborough and is aimed at those Air Arms which require a multirole aircraft to fulfil both training and light strike roles. 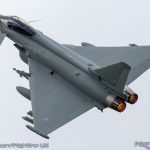 The upgrade can be purchased off the shelf or can be retrofitted to the original versions which are currently entering service with Italy, Israel, Singapore and Poland. 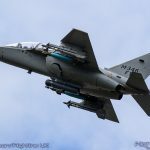 Like many of the jets in the display, it carrying a representative weapons load to highlight the dual-role. 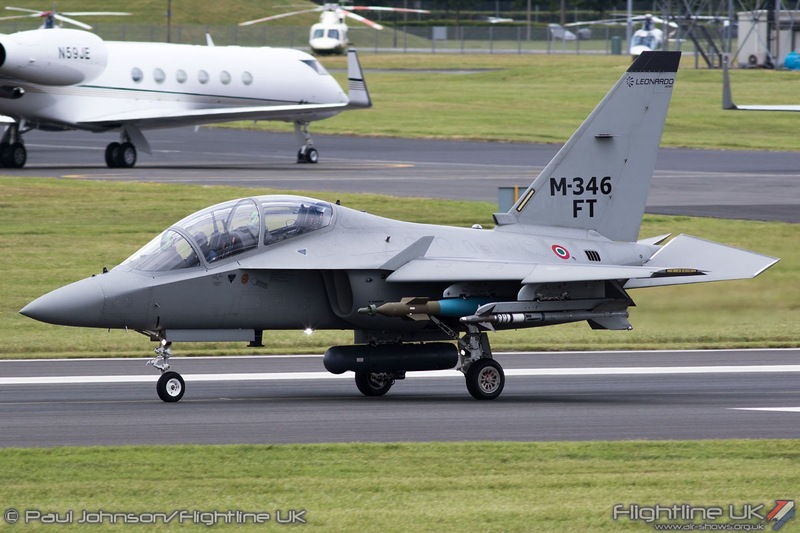 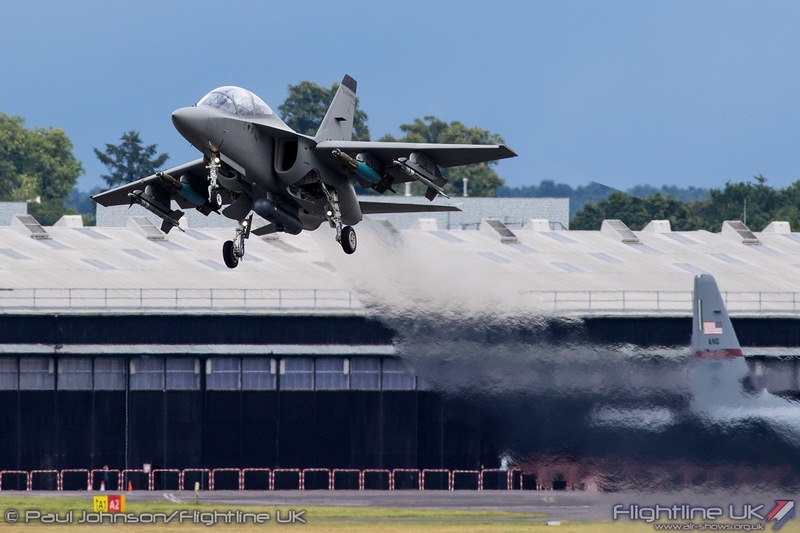 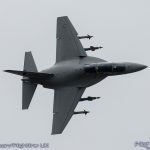 The M346 is also under consideration for the USAF’s next generation jet trainer as the T-100. 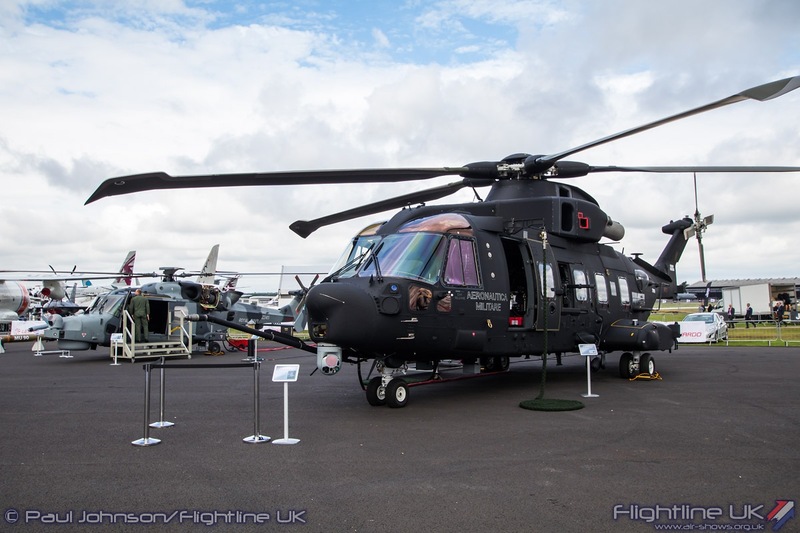 A mock-up in the potential USAF configuration was on display in Leonardo’s exhibition. 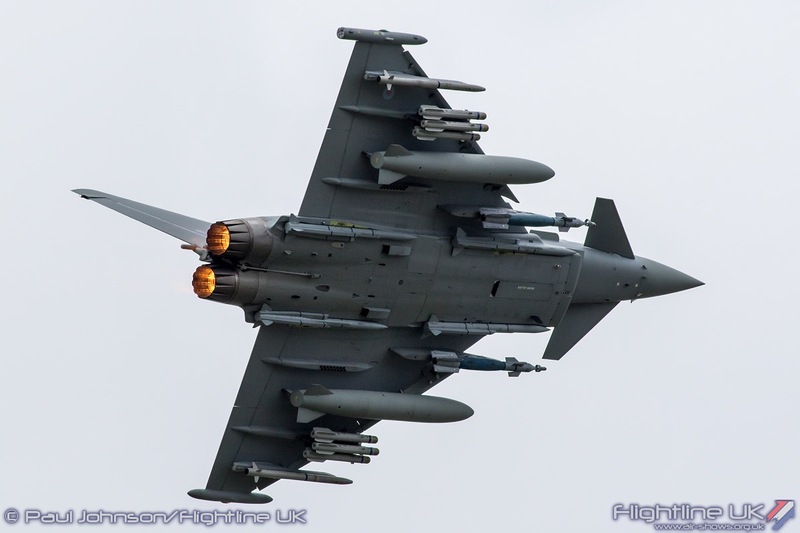 BAE Systems also displayed Eurofighter Typhoon IPA7 with a weapons load in the flying display. 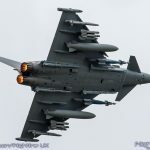 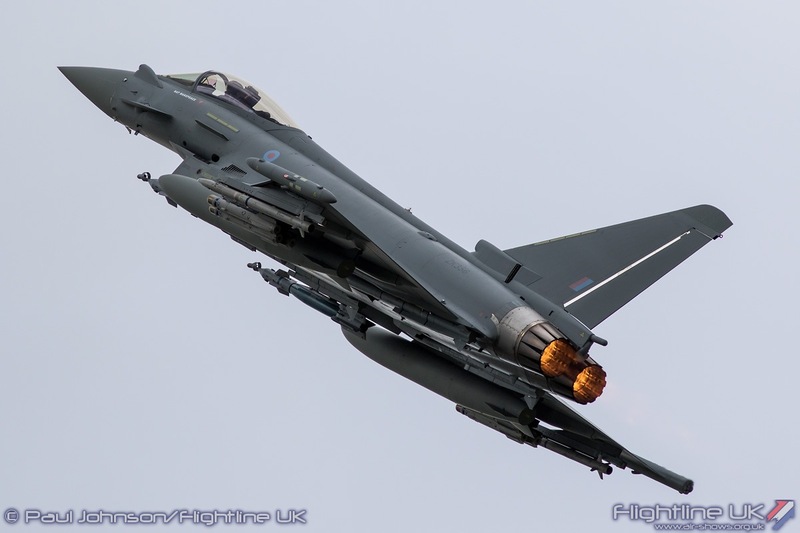 This was to highlight the Phase 3 Enhancements planned for the RAF’s Typhoon fleet which will enabled the type to carry Brimstone II air-to-ground missiles and Meteor Air-to-Air Missiles alongside Paveway IV guided bombs and ASRAAM air-to-air missiles. 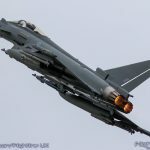 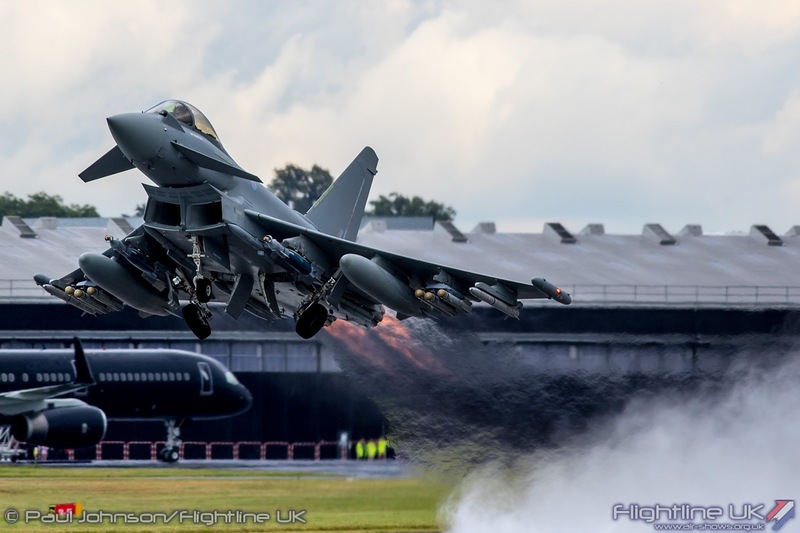 Nat Makepeace’s display in Typhoon highlighted the incredible performance and carefree handling that Typhoon still enjoyed despite the full weapons load. 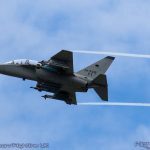 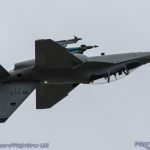 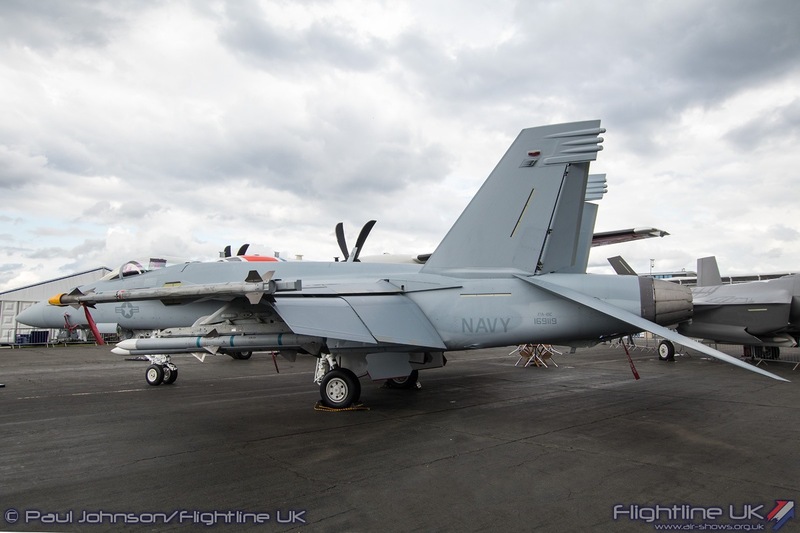 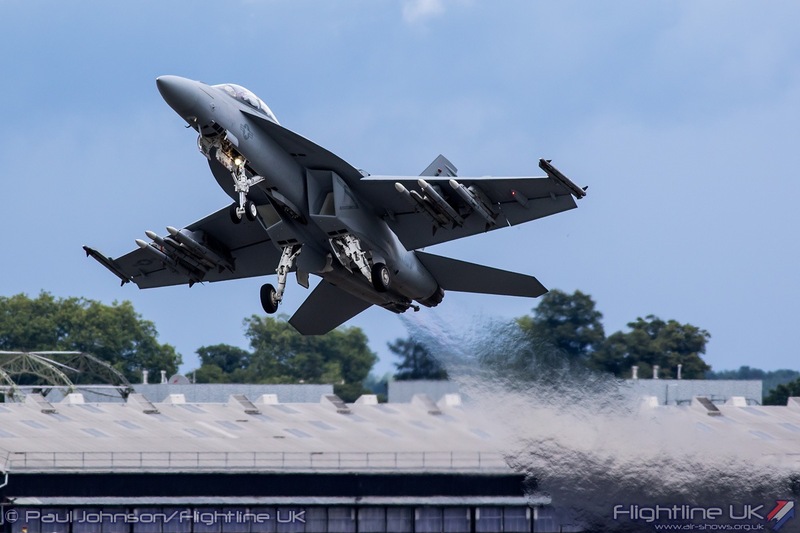 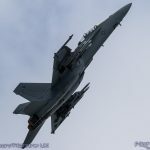 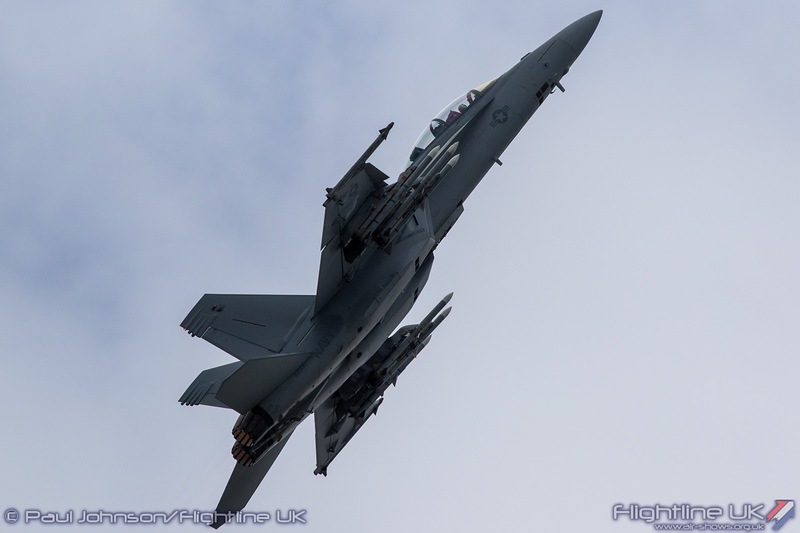 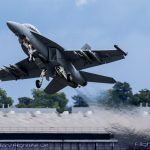 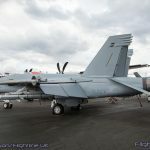 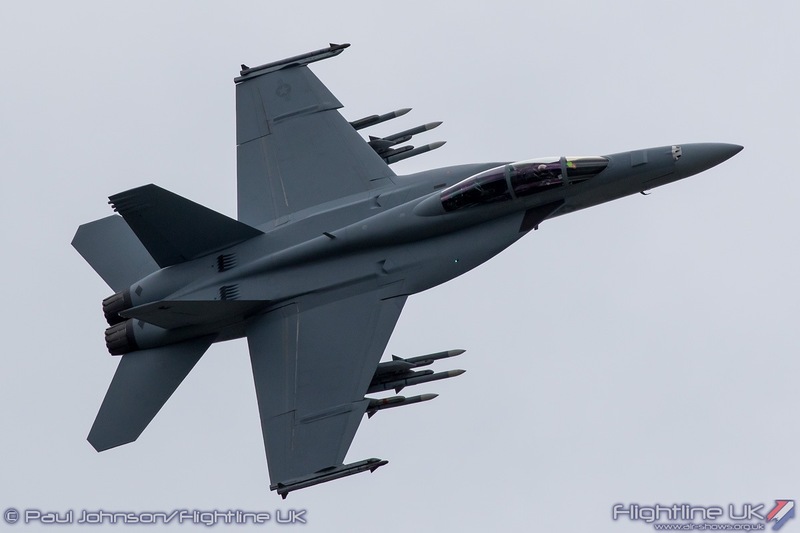 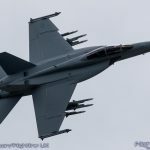 Boeing has been displaying the F/A-18F Super Hornet with full weapons loads since it made its Farnborough debut in 2000. 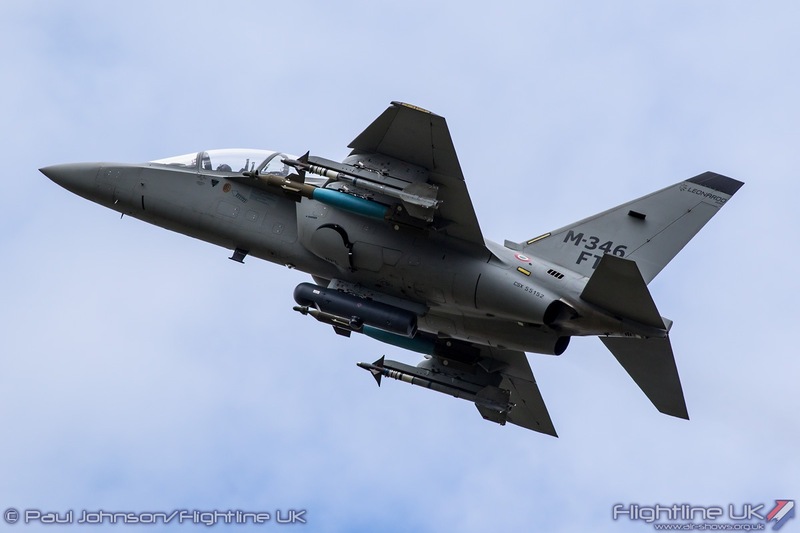 As it pervious years, it was displayed at Farnborough with a full complement of AIM-120 AMRAAM and AIM-9 Sidewinder missiles for its unique display of agility. 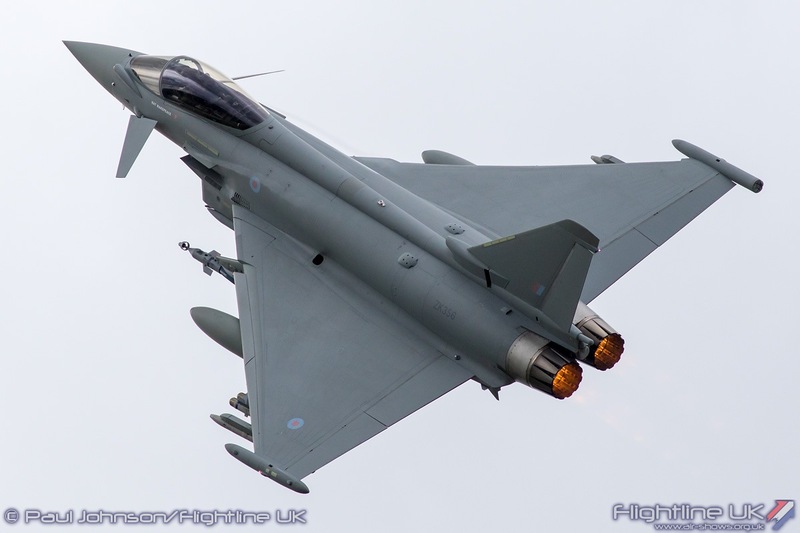 It is a very powerful performer capable of some impossibly tight turns and high-alpha manoeuvres. 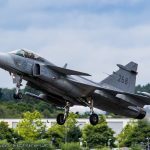 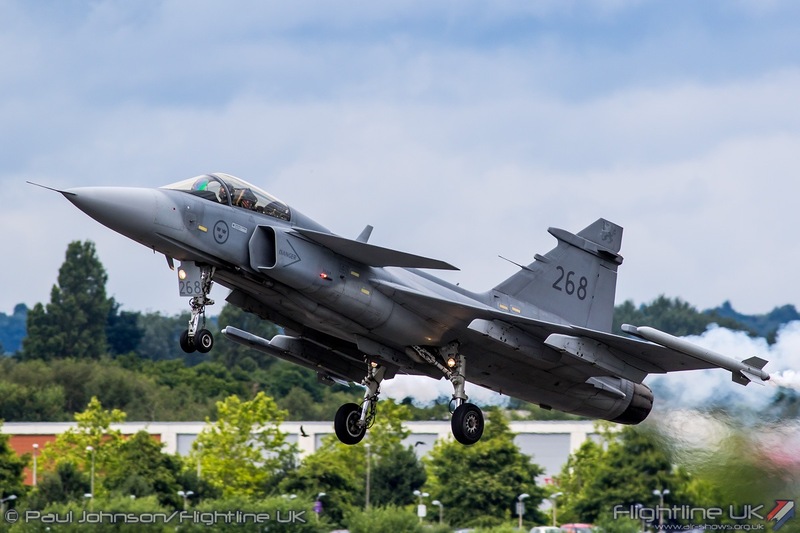 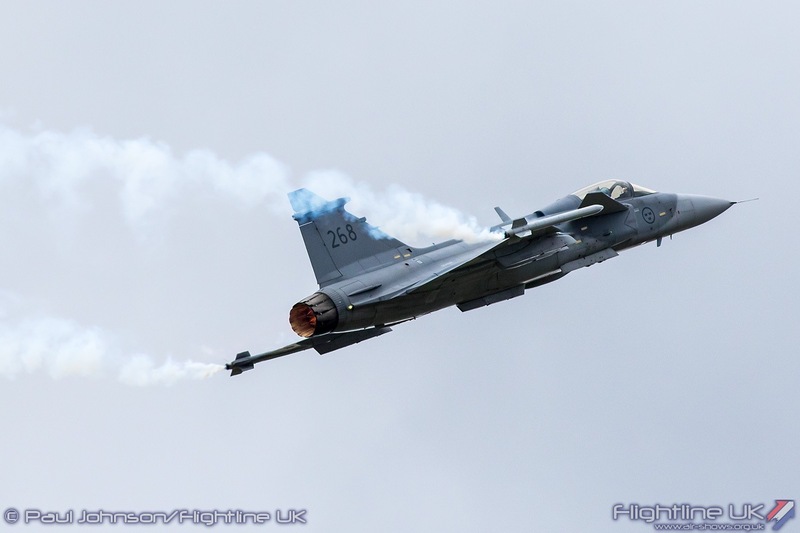 Appearing during the first half of the Farnborough week was the SAAB JAS-39C Gripen. 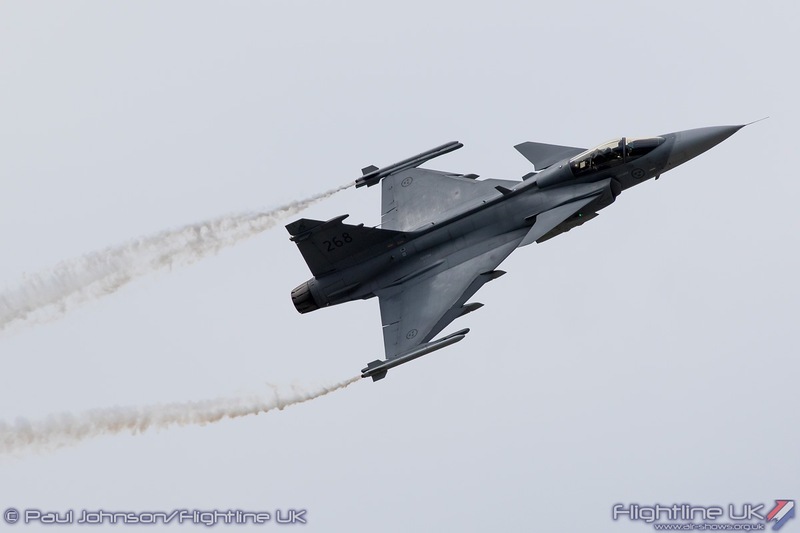 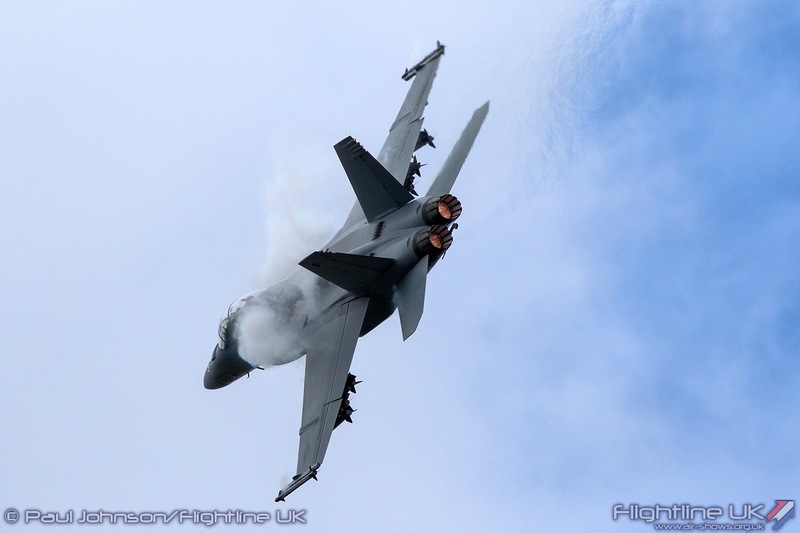 Unlike the Typhoon and F/A-18F which were displayed by company test pilots, the Gripen was flown by the Swedish Air Force display pilot, Captain Peter Fallen. 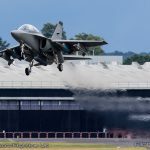 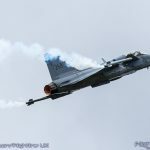 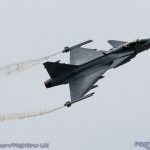 As ever, the Gripen provided a fast paced punchy routine even though Peter had to remove many of the aerobatic figures that would have occurred at the town-end of the airfield to comply with Farnborough’s strict display regulations. 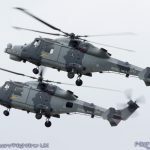 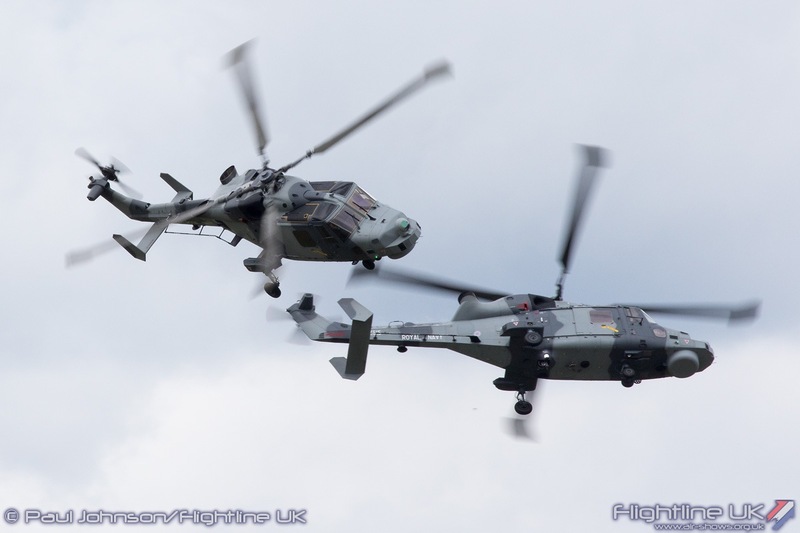 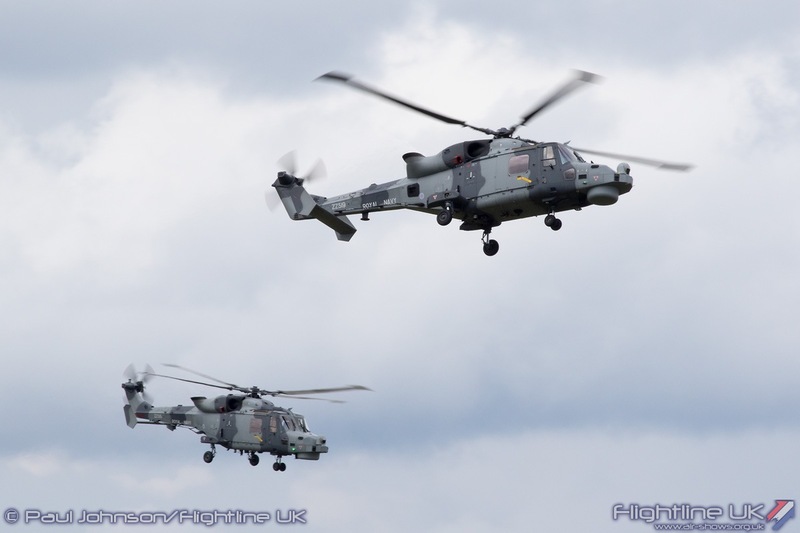 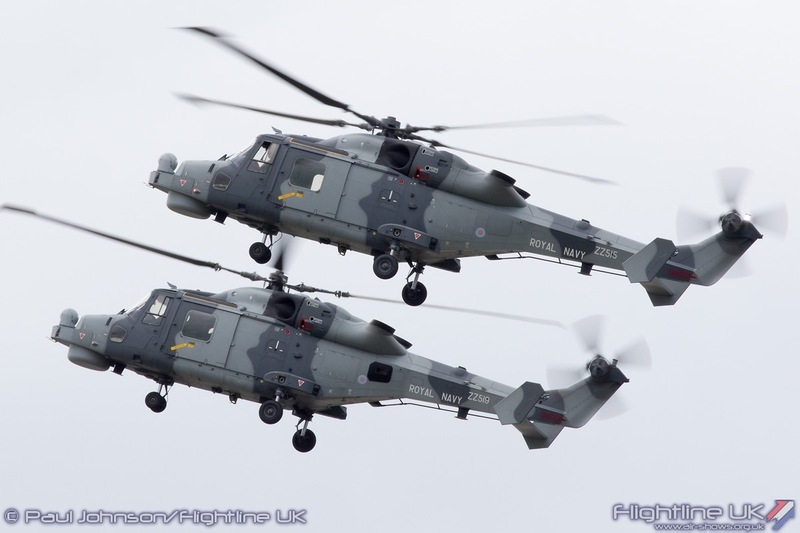 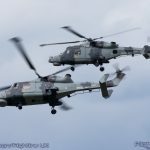 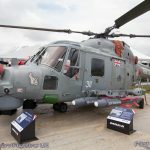 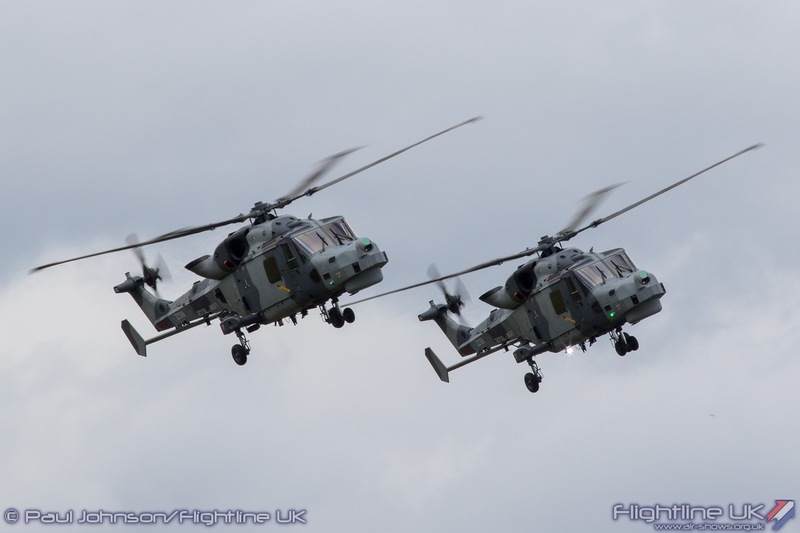 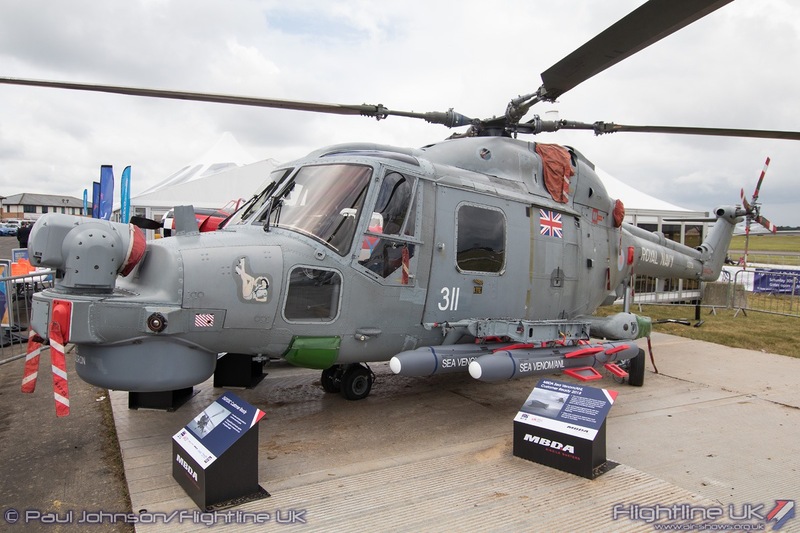 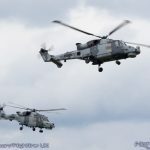 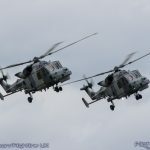 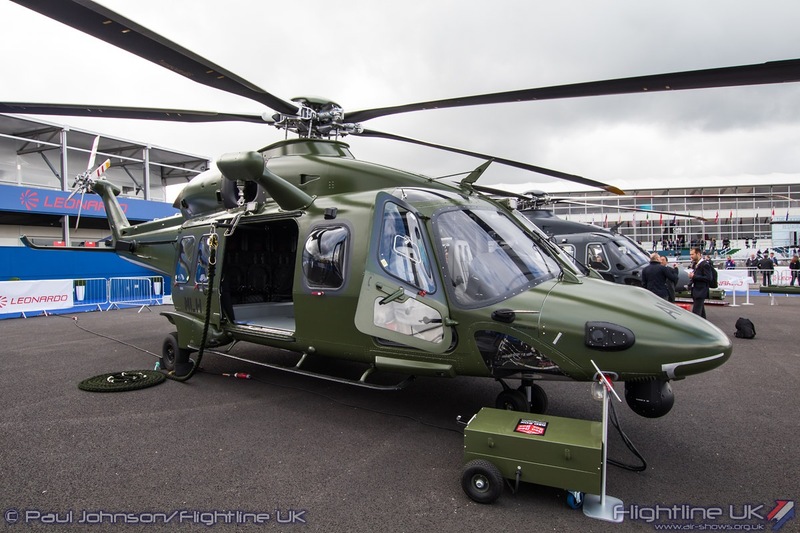 Continuing the military theme were the Royal Navy Black Cats flying a pair of AgustaWestland AW159 Wildcat HMA2 helicopters on behalf of Leonardo. 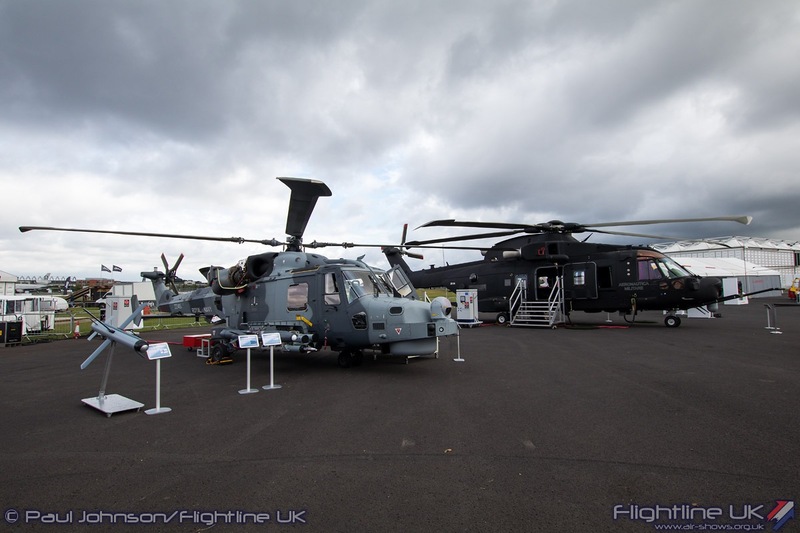 The team only appeared on the Monday and Tuesday and provided the only rotary action for any of the trade days this year! 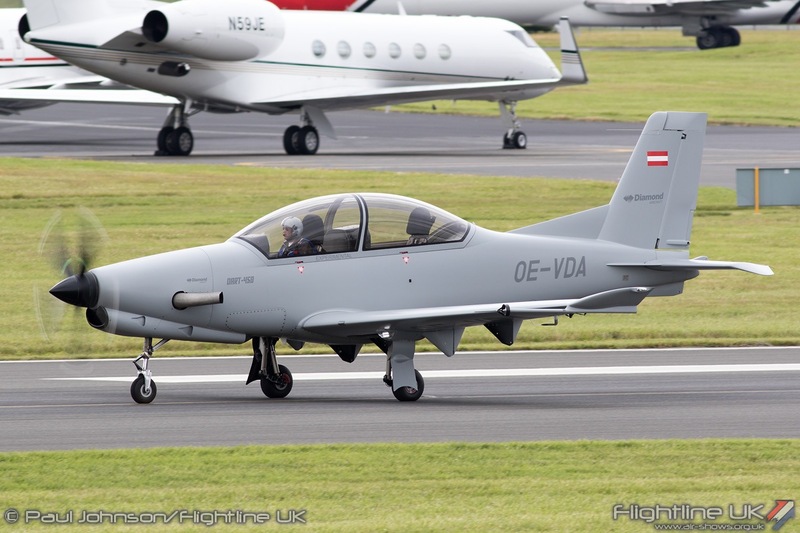 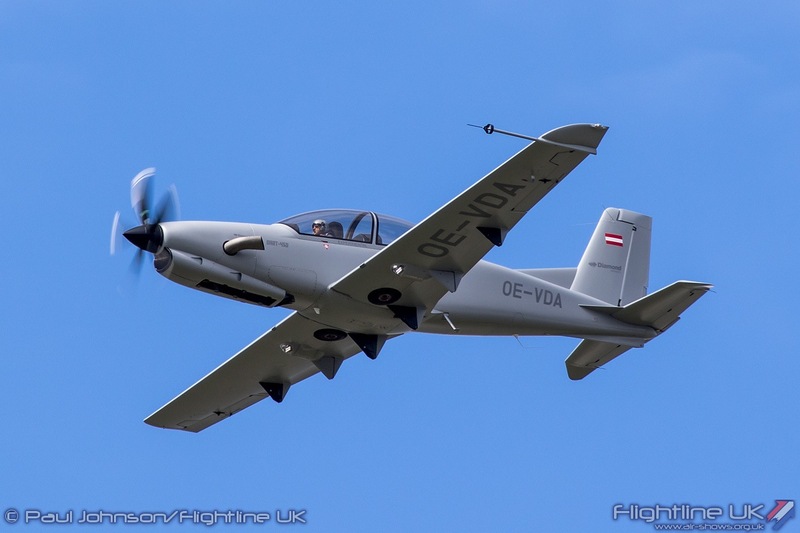 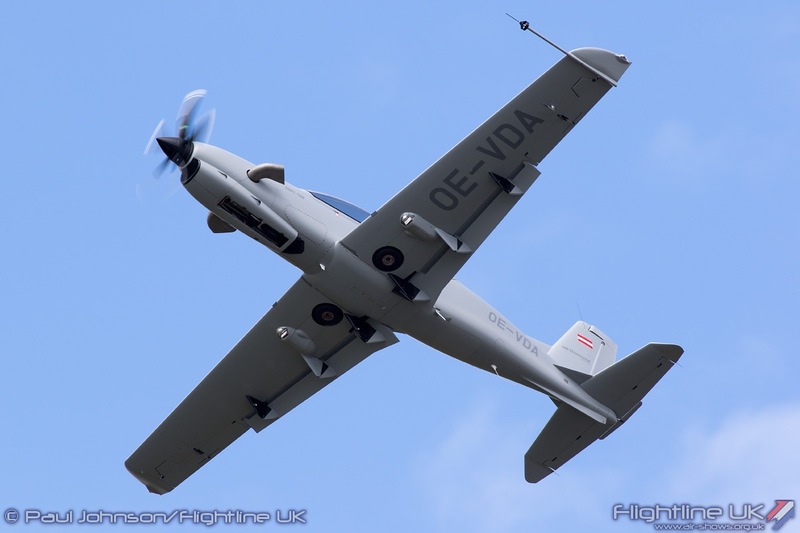 Diamond Aircraft displayed their new military training aircraft during the flying display, the Diamond Dart 450. 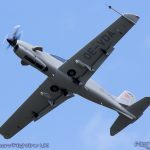 Designed as a very efficient and cost effective trainer, Diamond also envisages the type being used for the surveillance mission. 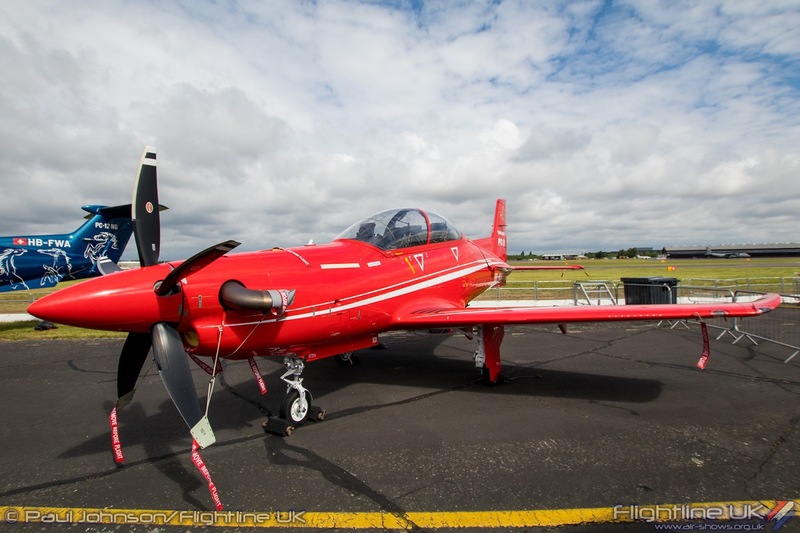 Similar, but much smaller than the Tucano or PC-9, the Dart is very quiet and a nimble performer. 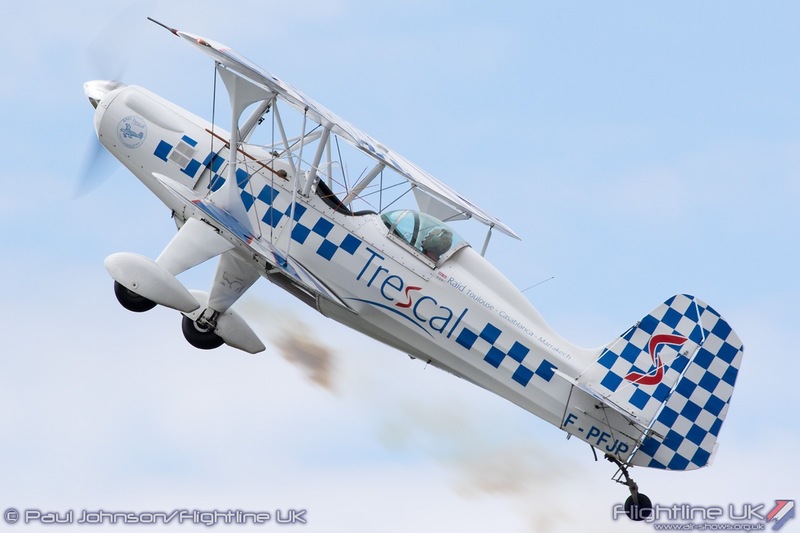 Another aerobatic routine came from the Stolp Starduster Too highlighting aerospace company Trescal. 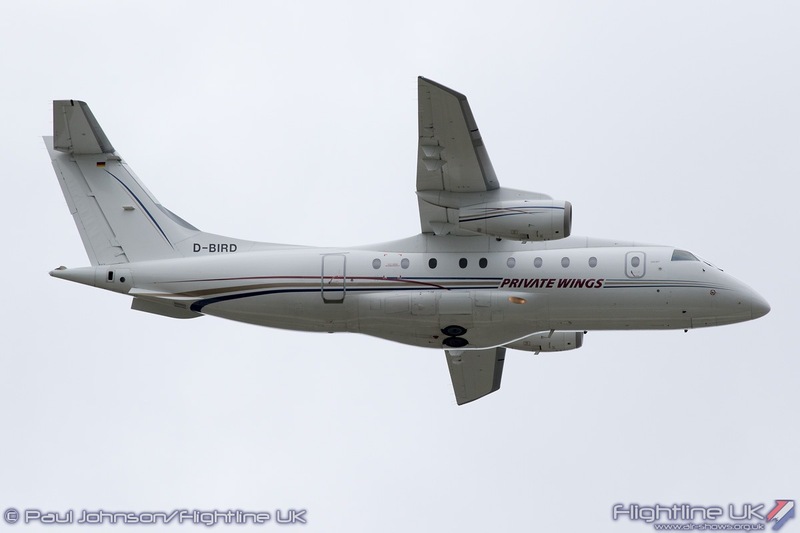 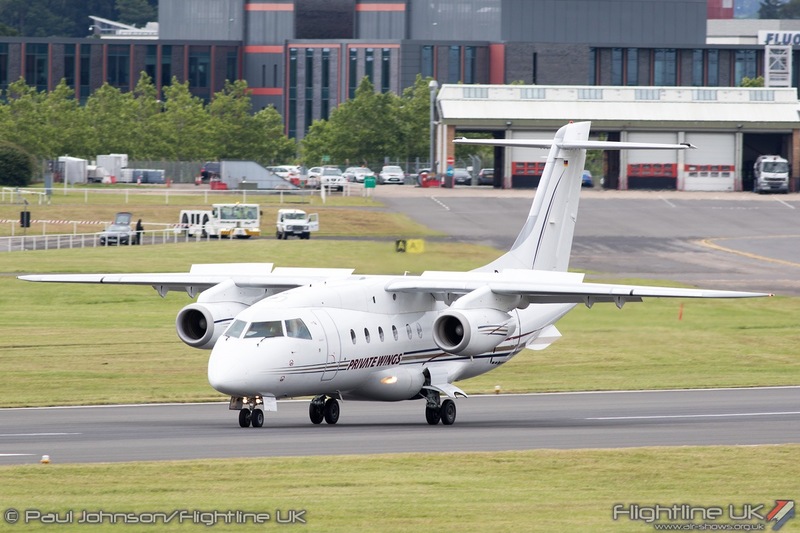 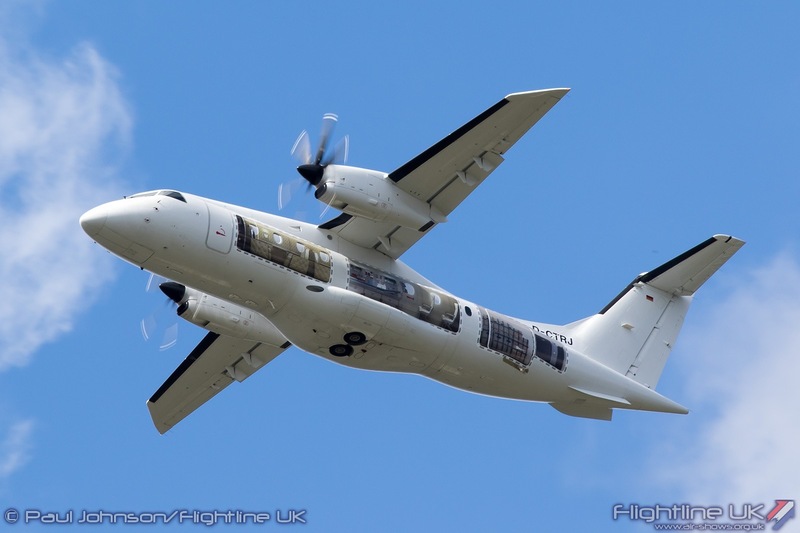 A type making a comeback at Farnborough this year was the Dornier 328. 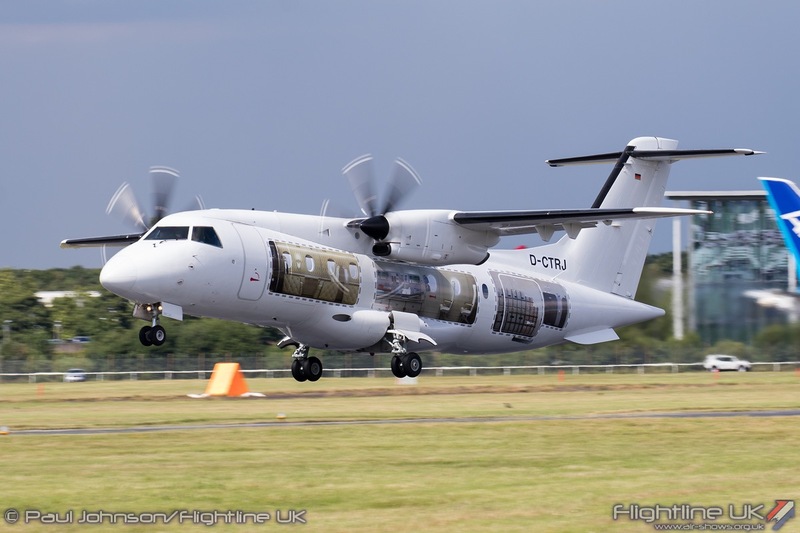 Now under the management of TRJet, the Dornier 328 comes in two flavours; the traditional turboprop configuration or the Dornier 328JET powered by two turbofans. 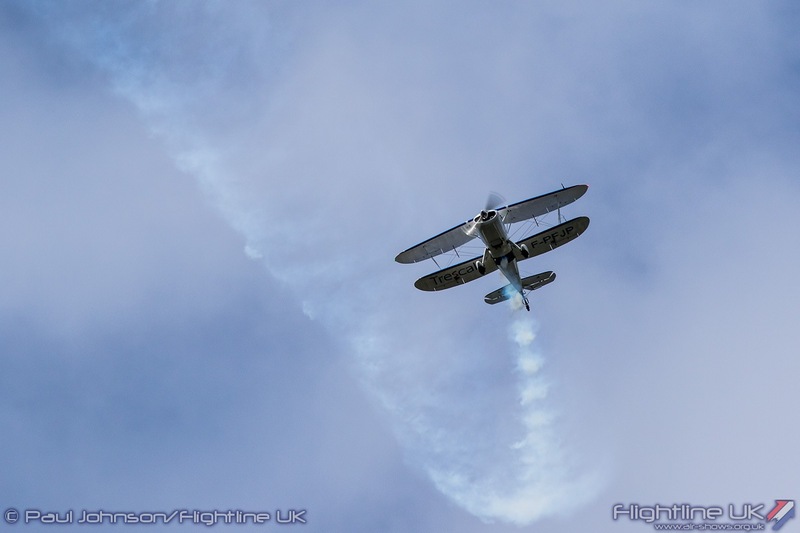 Both varieties appeared in the flying display on alternate days performing a same routine. 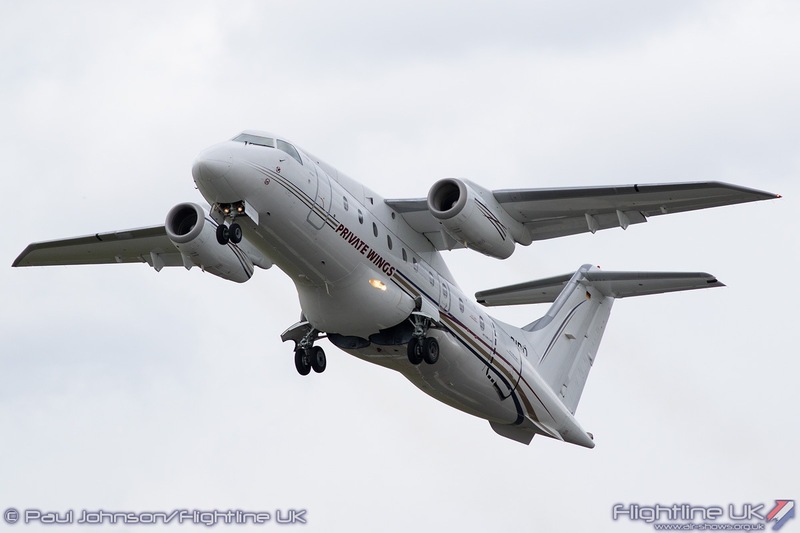 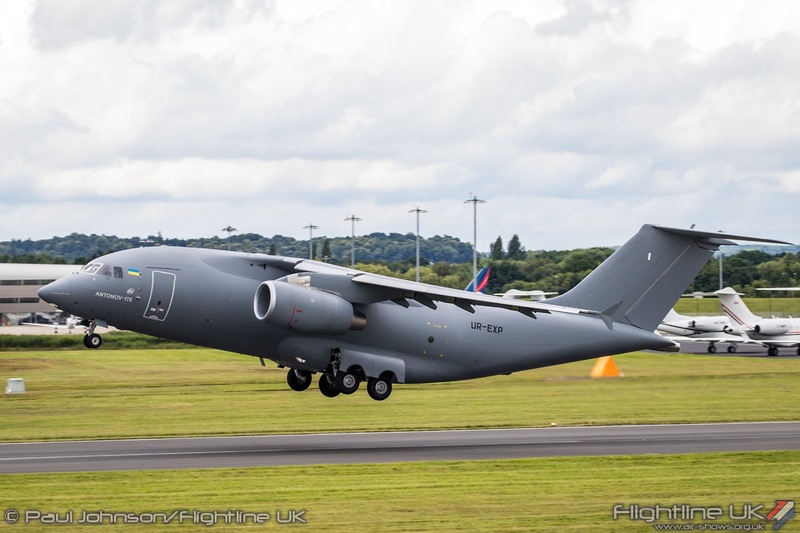 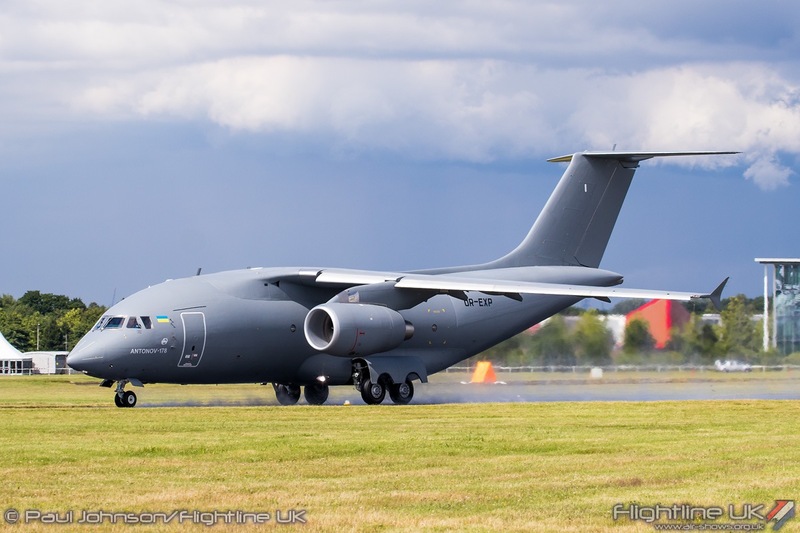 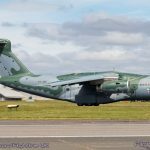 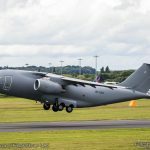 A type making its Farnborough debut in the flying was the Antonov An-178 medium cargo lifter. 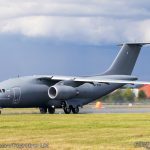 The latest in the 1×8 family, the An-178 is optimised for military operations from austere landing sites being fitted with more rugged landing gear. 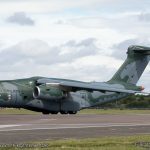 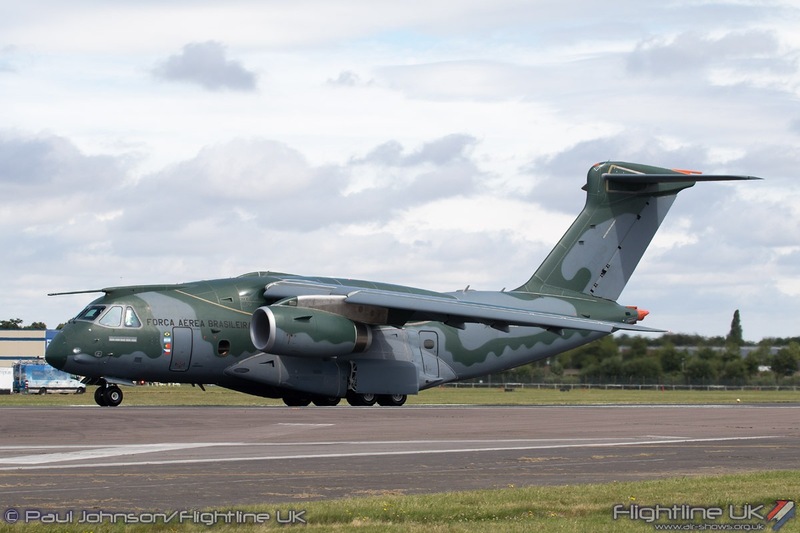 It is in a similar class to the Embraer KC-390 and has already generated interest from a number of nations. 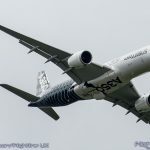 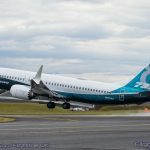 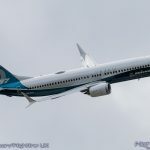 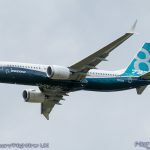 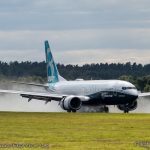 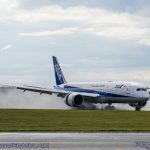 A significant chunk of the daily flying displays during the trade week were given over to Boeing products. 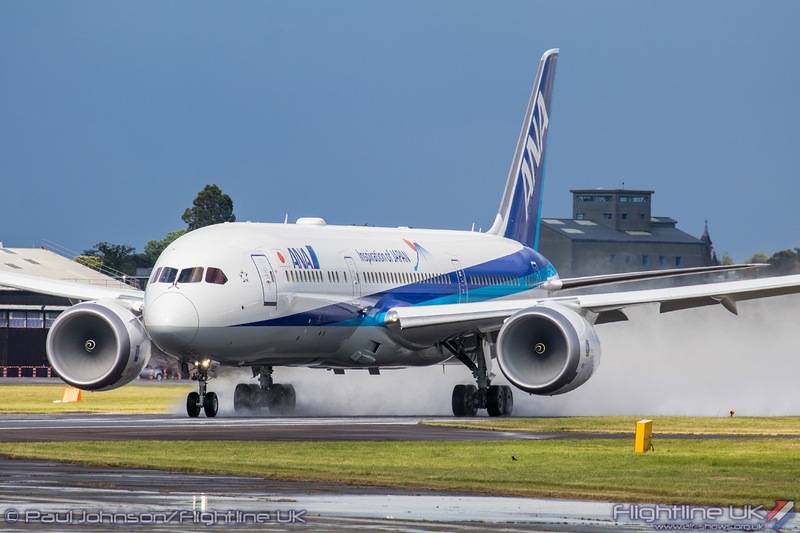 Opening the stream of Boeing displays was their newest design, the Boeing 787-900 Dreamliner. 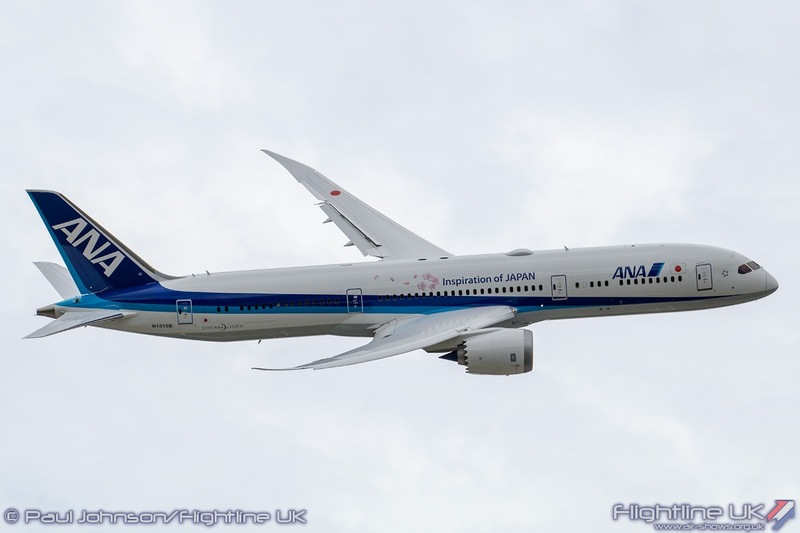 This, perhaps one of the most attractive modern airliners, appeared in the colours of Japanese Airline, All Nippon Airways. 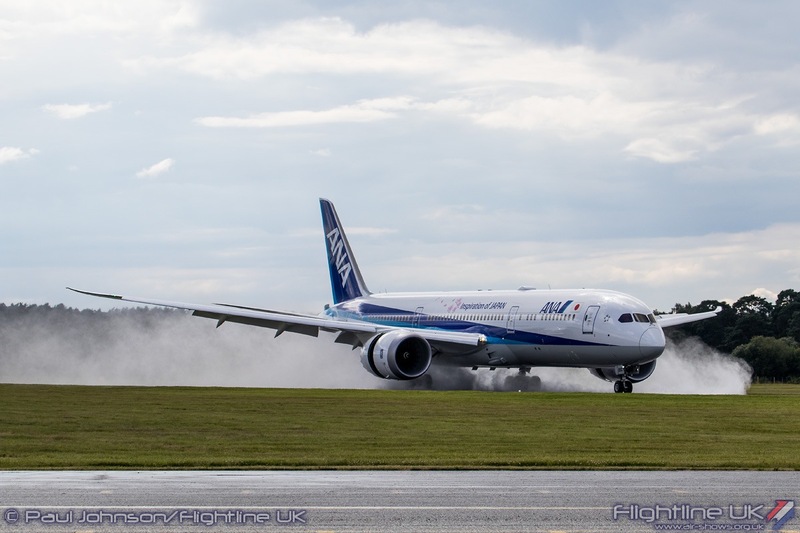 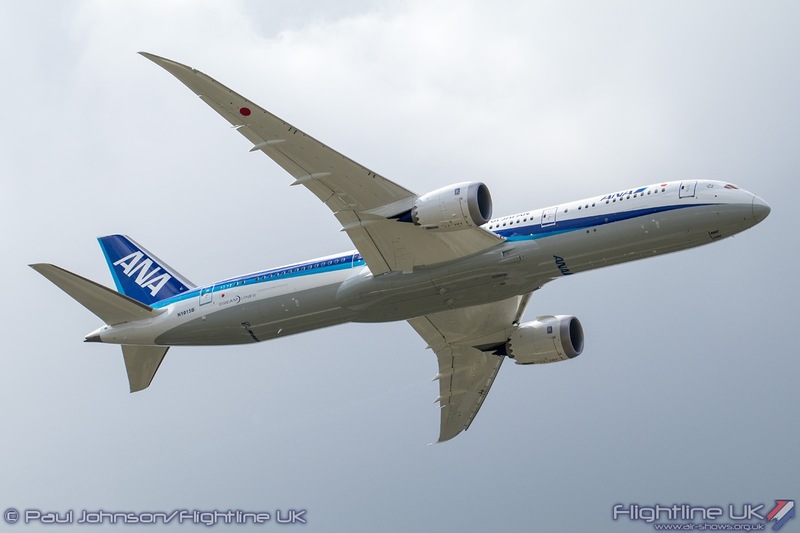 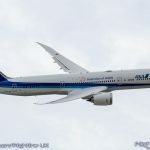 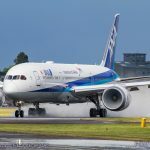 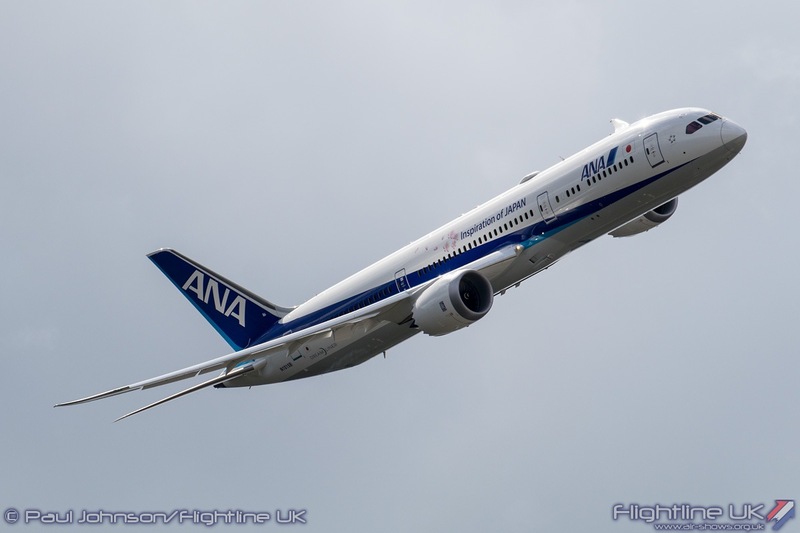 It gave a very elegant display showing off that beautiful sweeping, curving wing that characterises the Dreamliner. 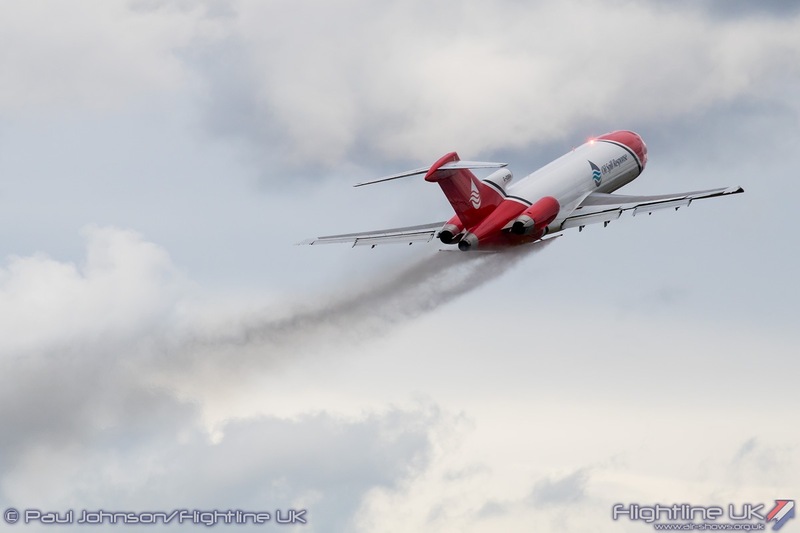 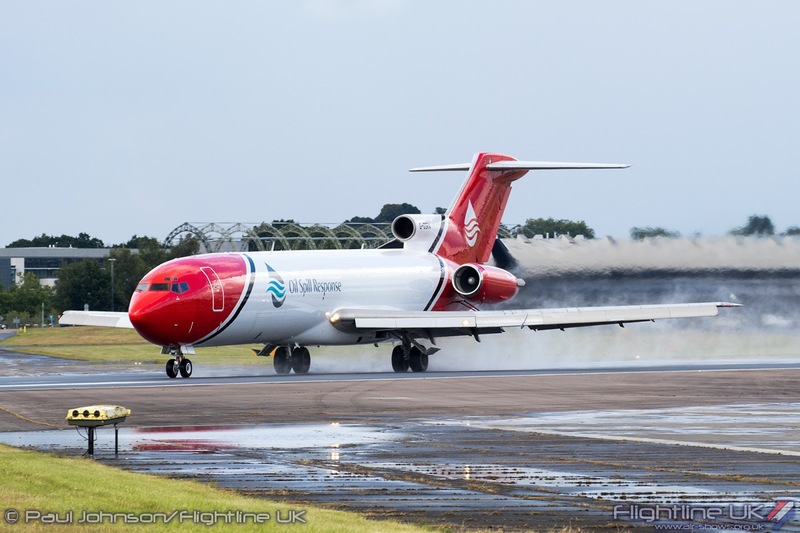 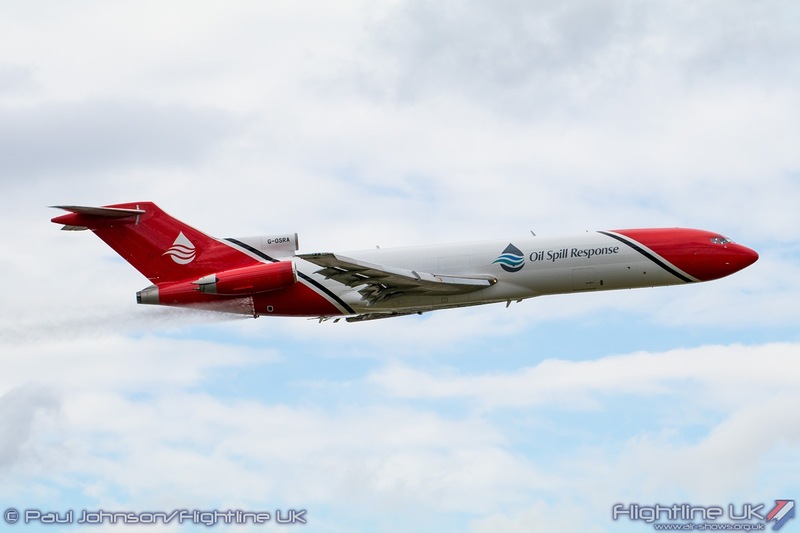 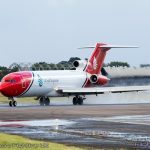 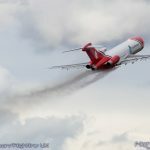 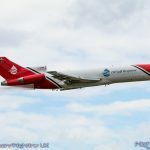 It was followed by the oldest Boeing airliner design in the display, the Boeing 727-2S2F from T2 Aviation and Oil Spill Response. 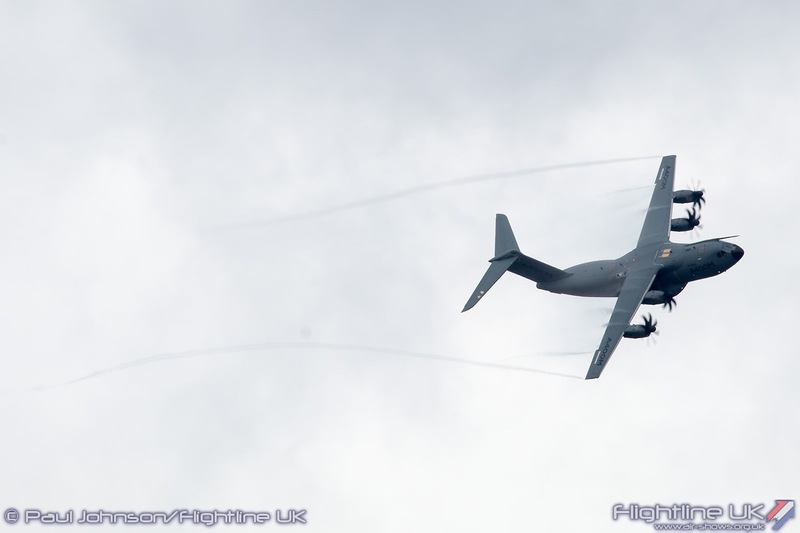 It gave just one, but very noisy flypast during its display simulating a low-level drop of oil-dispersing agent over the airfield. 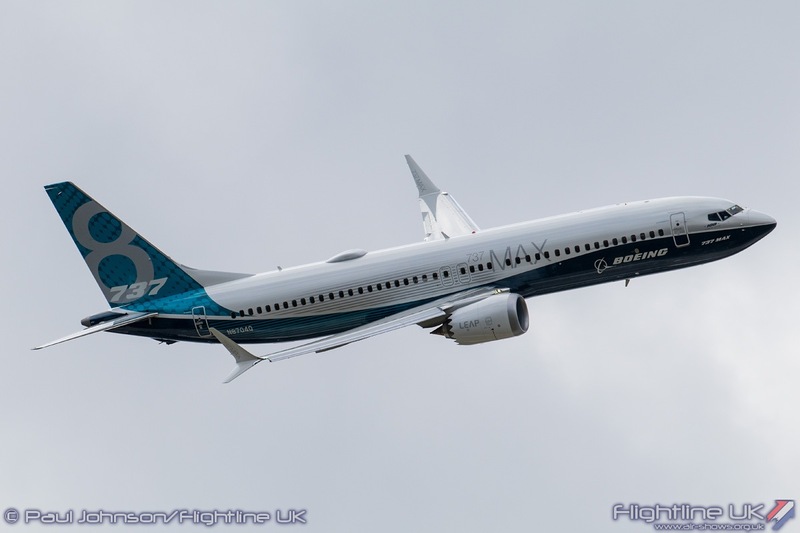 Boeing’s latest incarnation of the popular 737 range came next in the form of the Boeing 737MAX. 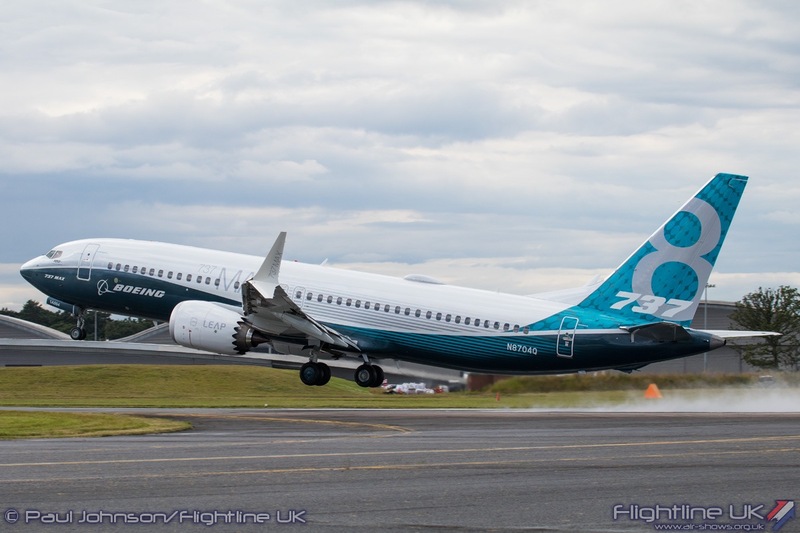 The 737MAX can easily be distinguished from other 737s by its extraordinary X-shaped winglets. 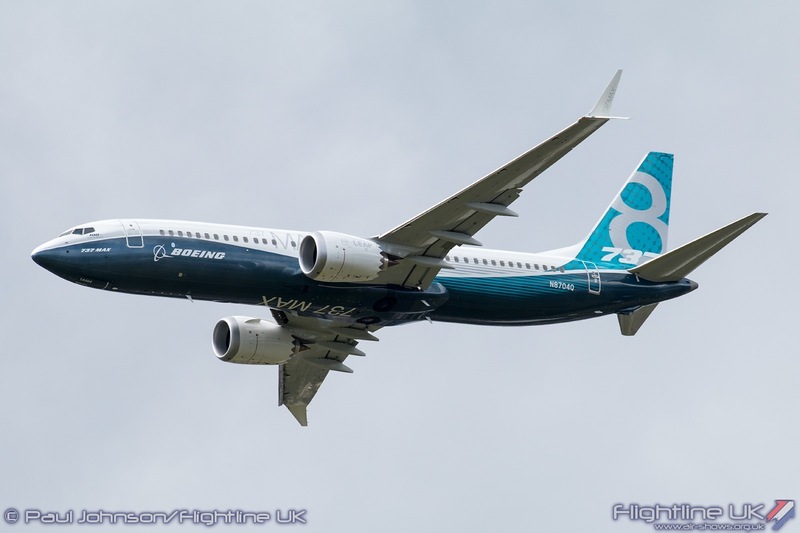 These dramatically increase the efficiency of the classic 737 ensuring a long-term future for the type. 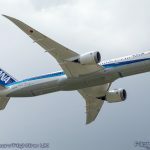 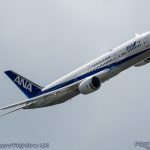 Like the 787, it gave an impressive performance with an eye-catching topside pass. 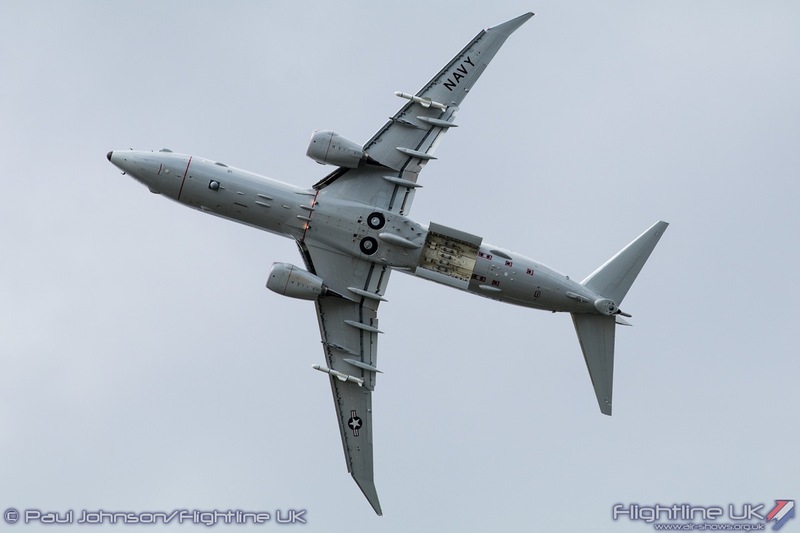 Closing Boeing’s contribution to the flying was the P-8A Poseidon. 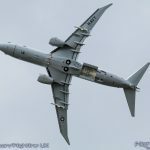 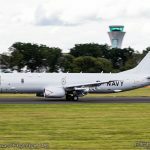 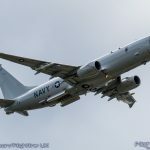 While it is based on the 737-800NG, it is purpose built for the maritime patrol role with a unique wing design plus an internal weapons bay and sensor fit. 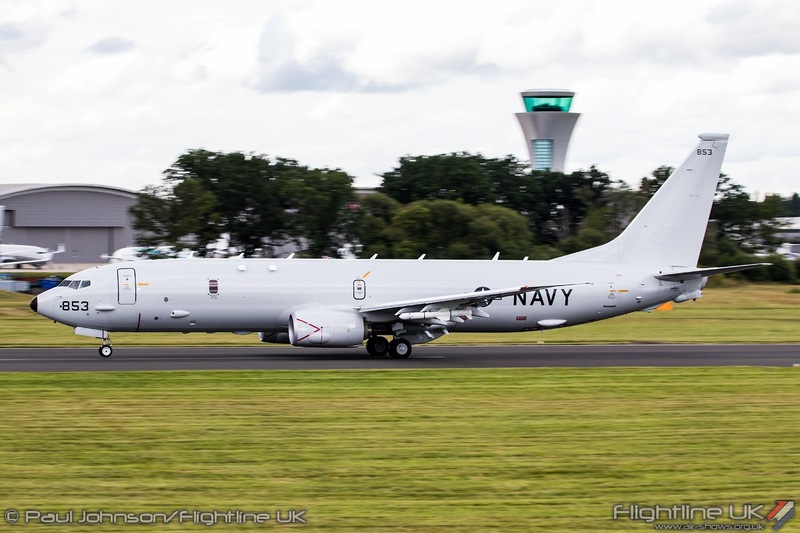 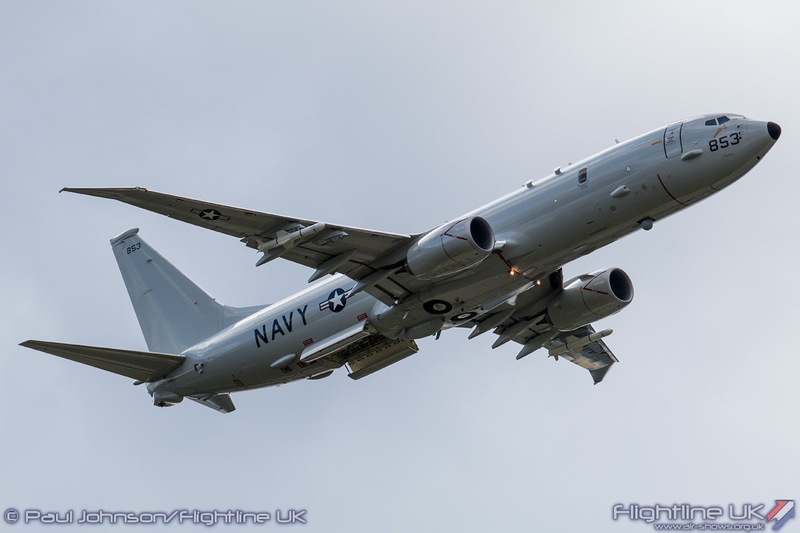 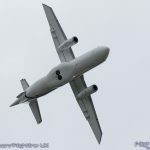 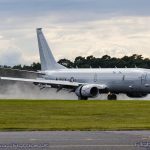 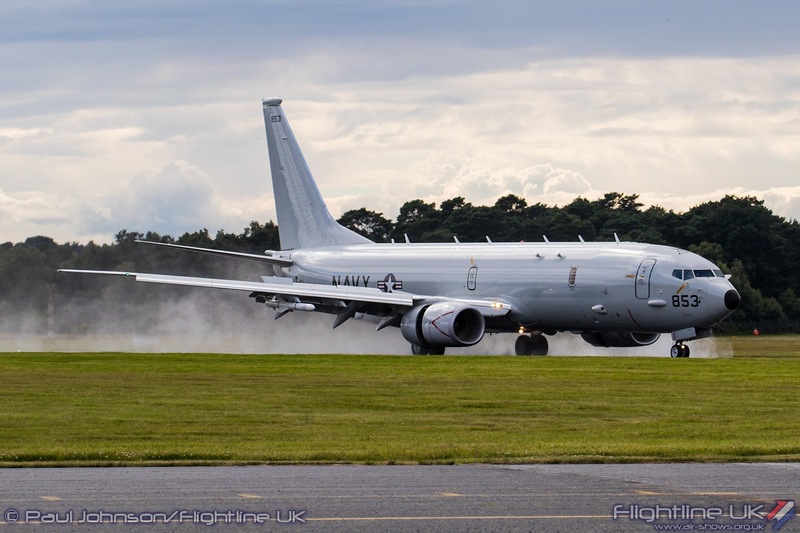 The P-8 provided one of the headlines of the Farnborough week when Prime Minister David Cameron signed the contact for nine examples for the Royal Air Force alongwith an order for 50 Boeing AH-64E Apache Guardian helicopters for the British Army. 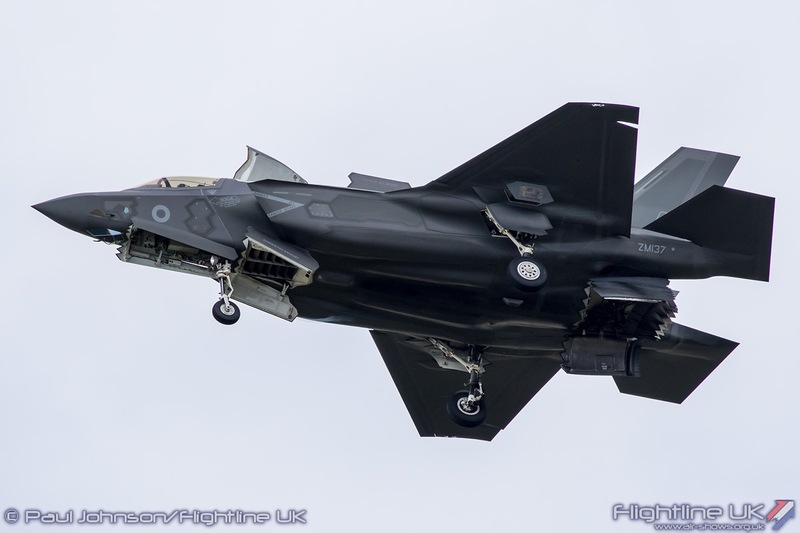 However the jewel in the crown for Farnborough was the appearance of the Lockheed Martin F-35B Lightning II. 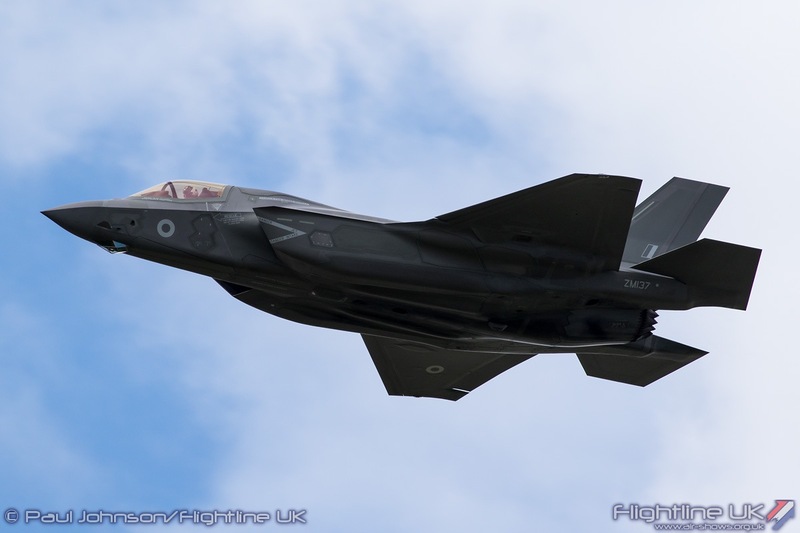 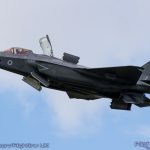 Jointly displayed by the United States Marine Corps, Royal Air Force and Royal Navy the F-35B appeared on the Monday, Tuesday and Friday. 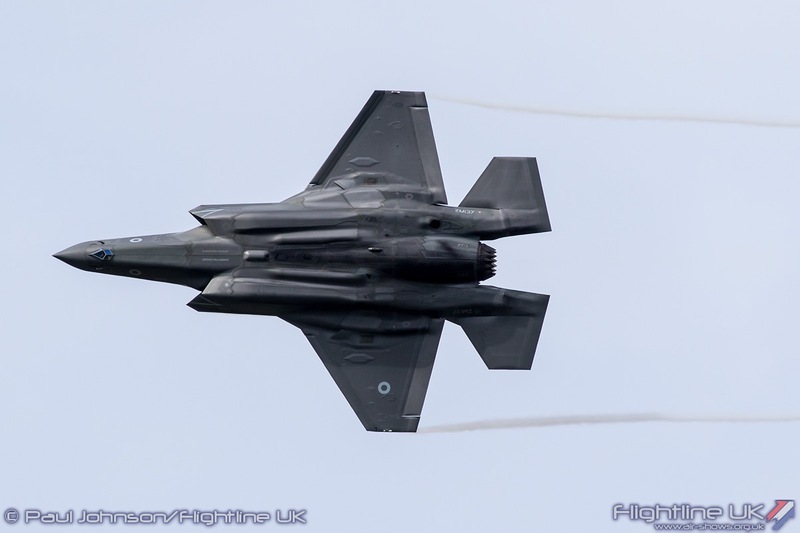 Monday saw the F-35B open Farnborough in a flypast with the Red Arrows. 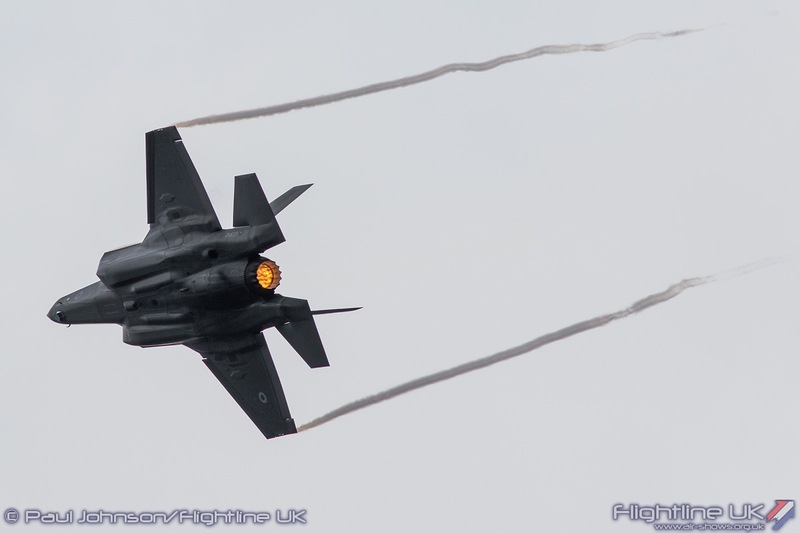 Tuesday saw a much bigger showing for the F-35B. 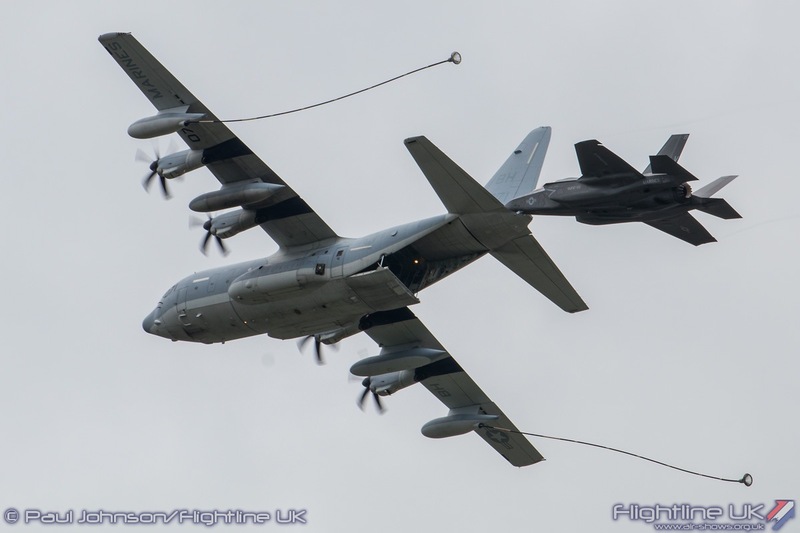 Opening the main display was a flypast by a USMC Lockheed Martin KC-130J Hercules II tanker and F-35B simulating air-to-air refuelling. 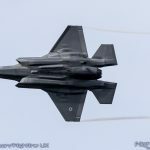 The solo display that appeared later was the same as performed at RIAT, though they aircraft did not perform a vertical landing. 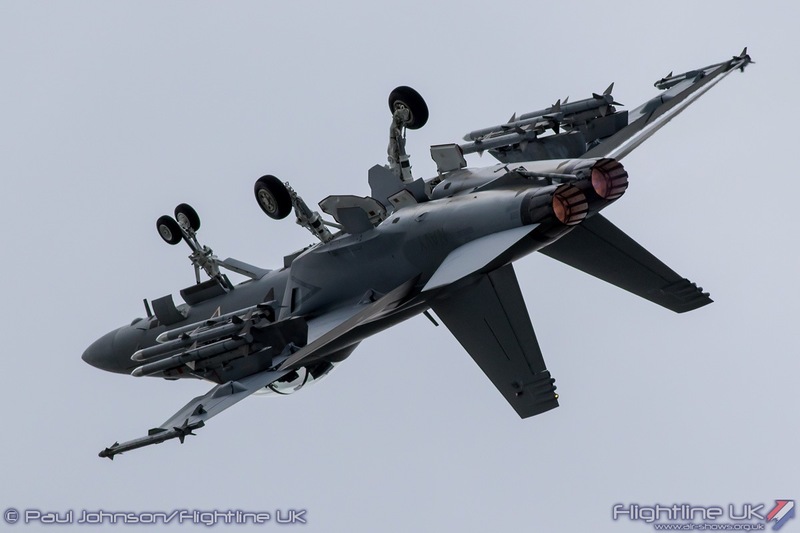 It is incredibly stable in the hover which is now a far more automated process than that in previous V/STOL designs such as the Harrier. 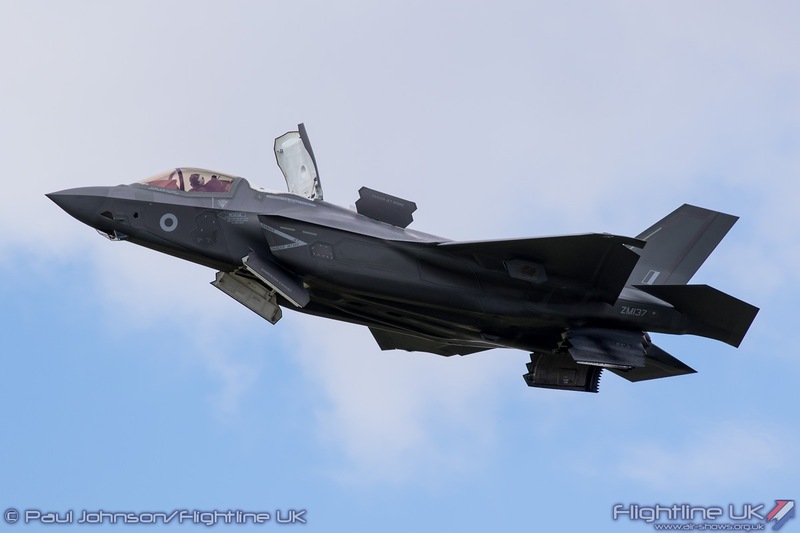 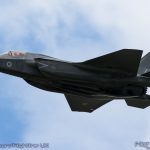 Pete ‘Wizzer’ Wilson, the BAE Systems Project Test Pilot, who gave a briefing about the F-35 development to the media during the week could not be enthusiastic about the F-35’s STOVL capabilities. 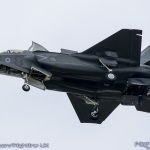 “AWESOME” was his simple description of the STOVL system which reduces pilot workload significant making Vertical landings a much more reliable and safer event during F-35 operations. 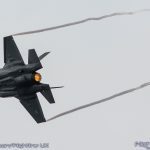 More is to come from the F-35 in future years. 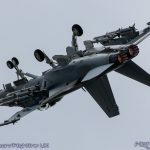 The example on display at RIAT and Farnborough still operate with interim software which doesn’t yet explore the full flight envelope. 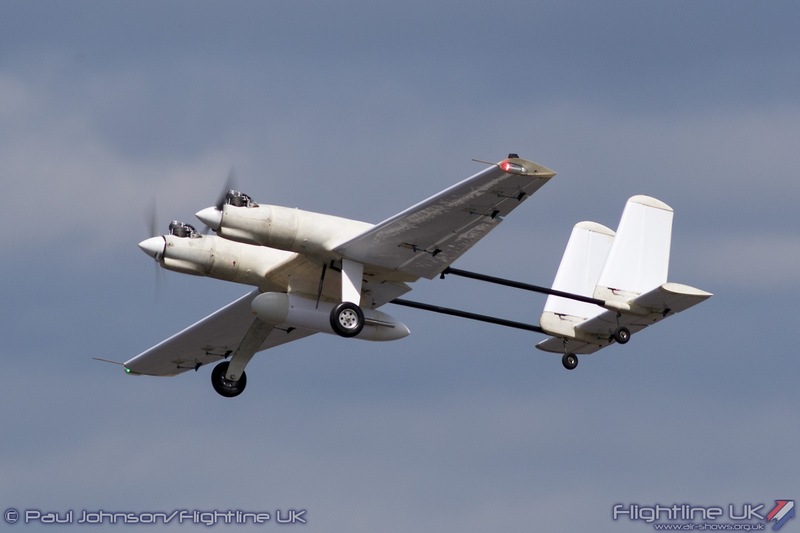 The final software is currently on the testing fleet and will hopefully be seen at future Farnborough Airshows.